Abell, L. M. & Schloss, J. V. (1991). Oxygenase side reactions of acetolactate synthase and other carbanion-forming enzymes. Biochemistry, 30, 7883-7887. Adams, M. W. & Kletzin, A. (1996). Oxidoreductase-type enzymes and redox proteins involved in fermentative metabolisms of hyperthermophilic Archaea. Advances in protein chemistry, 48, 101-180. Adinolfi, A., Moratti, R., Olezza, S. & Ruffo, A. (1969). Control of the citric acid cycle by glyoxylate. The mechanism of inhibition of oxoglutarate dehydrogenase, isocitrate dehydrogenase and aconitate hydratase. The Biochemical journal, 114, 513-518. Adinolfi, A., Olezza, S. & Ruffo, A. (1967). Inhibition of 2-oxoglutarate dehydrogenase by glyoxylate and its condensation compounds. The Biochemical journal, 104, 50P-51P. Aevarsson, A., Chuang, J. L., Wynn, R. M., Turley, S., Chuang, D. T. & Hol, W. G. (2000). Crystal structure of human branched-chain alpha-ketoacid dehydrogenase and the molecular basis of multienzyme complex deficiency in maple syrup urine disease. Structure, 8, 277-291. Aevarsson, A., Seger, K., Turley, S., Sokatch, J. R. & Hol, W. G. (1999). Crystal structure of 2-oxoisovalerate and dehydrogenase and the architecture of 2-oxo acid dehydrogenase multienzyme complexes. Nature structural biology, 6, 785-792. Akita, K., Fujimura, Y., Bajotto, G. & Shimomura, Y. (2009). Inhibition of branched-chain -ketoacid dehydrogenase kinase by thiamine pyrophosphate at different potassium ionic levels. Bioscience, Biotechnology, and Biochemistry, 73, 1189-1191. Akiyama, S. K. & Hammes, G. G. (1980). Elementary steps in the reaction mechanism of the pyruvate dehydrogenase multienzyme complex from Escherichia coli: kinetics of acetylation and deacetylation. Biochemistry, 19, 4208-4213. Aleshin, V. A., Artiukhov, A. V., Oppermann, H., Kazantsev, A. V., Lukashev, N. V. & Bunik, V. I. (2015). Mitochondrial Impairment May Increase Cellular NAD(P)H: Resazurin Oxidoreductase Activity, Perturbing the NAD(P)H-Based Viability Assays. Cells, 4, 427-451. Allen, E. L., Ulanet, D. B., Pirman, D., Mahoney, C. E., Coco, J., Si, Y., Chen, Y., Huang, L., Ren, J., Choe, S., Clasquin, M. F., Artin, E., Fan, Z. P., Cianchetta, G., Murtie, J., Dorsch, M., Jin, S. & Smolen, G. A. (2016). Differential Aspartate Usage Identifies a Subset of Cancer Cells Particularly Dependent on OGDH. Cell reports, 17, 876-890. Amaral, A. I., Teixeira, A. P., Martens, S., Bernal, V., Sousa, M. F. & Alves, P. M. (2010). Metabolic alterations induced by ischemia in primary cultures of astrocytes: merging 13C NMR spectroscopy and metabolic flux analysis. Journal of neurochemistry, 113, 735-748. Amaral, A. U., Cecatto, C., Seminotti, B., Ribeiro, C. A., Lagranha, V. L., Pereira, C. C., de Oliveira, F. H., de Souza, D. G., Goodman, S., Woontner, M. & Wajner, M. (2015). Experimental evidence that bioenergetics disruption is not mainly involved in the brain injury of glutaryl-CoA dehydrogenase deficient mice submitted to lysine overload. Brain research, 1620, 116-129. Ambrus, A., Nemeria, N. S., Torocsik, B., Tretter, L., Nilsson, M., Jordan, F. & Adam-Vizi, V. (2015). Formation of reactive oxygen species by human and bacterial pyruvate and 2-oxoglutarate dehydrogenase multienzyme complexes reconstituted from recombinant components. Free radical biology & medicine, 89, 642-650. Ambrus, A., Wang, J., Mizsei, R., Zambo, Z., Torocsik, B., Jordan, F. & Adam-Vizi, V. (2016). Structural alterations induced by ten disease-causing mutations of human dihydrolipoamide dehydrogenase analyzed by hydrogen/deuterium-exchange mass spectrometry: Implications for the structural basis of E3 deficiency. Biochimica et biophysica acta, 1862, 2098-2109. Anderson, N. M., Li, D., Peng, H. L., Laroche, F. J., Mansour, M. R., Gjini, E., Aioub, M., Helman, D. J., Roderick, J. E., Cheng, T., Harrold, I., Samaha, Y., Meng, L., Amsterdam, A., Neuberg, D. S., Denton, T. T., Sanda, T., Kelliher, M. A., Singh, A., Look, A. T. & Feng, H. (2016). The TCA cycle transferase DLST is important for MYC-mediated leukemogenesis. Leukemia, 30, 1365-1374. Anusevicius, Z. J. & Cenas, N. K. (1993). Dihydrolipoamide-mediated redox cycling of quinones. Archives of biochemistry and biophysics, 302, 420-424. Araujo, W. L., Trofimova, L., Mkrtchyan, G., Steinhauser, D., Krall, L., Graf, A., Fernie, A. R. & Bunik, V. I. (2013). On the role of the mitochondrial 2-oxoglutarate dehydrogenase complex in amino acid metabolism. Amino acids, 44, 683-700. Arjunan, P., Chandrasekhar, K., Sax, M., Brunskill, A., Nemeria, N., Jordan, F. & Furey, W. (2004). Structural determinants of enzyme binding affinity: the E1 component of pyruvate dehydrogenase from Escherichia coli in complex with the inhibitor thiamine thiazolone diphosphate. Biochemistry, 43, 2405-2411. Arjunan, P., Wang, J., Nemeria, N. S., Reynolds, S., Brown, I., Chandrasekhar, K., Calero, G., Jordan, F. & Furey, W. (2014). Novel binding motif and new flexibility revealed by structural analyses of a pyruvate dehydrogenase-dihydrolipoyl acetyltransferase subcomplex from the Escherichia coli pyruvate dehydrogenase multienzyme complex. The Journal of biological chemistry, 289, 30161-30176. Armstrong, C. T., Anderson, J. L. & Denton, R. M. (2014). Studies on the regulation of the human E1 subunit of the 2-oxoglutarate dehydrogenase complex, including the identification of a novel calcium-binding site. The Biochemical journal, 459, 369-381. Arrieta-Cruz, I. & Gutierrez-Juarez, R. (2016). The Role of Circulating Amino Acids in the Hypothalamic Regulation of Liver Glucose Metabolism. Advances in nutrition, 7, 790S-797S. Artiukhov, A. V., Graf, A. V. & Bunik, V. I. (2016). Directed regulation of multienzyme complexes of 2-oxo acid dehydrogenases using phosphonate and phosphinate analogues of 2-oxo acids. Biochemistry (Mosc), 81, 1498-1521. Asmus, K. D. (1990). Sulfur-centered free radicals. Methods in enzymology, 186, 168-180. Baeza, J., Smallegan, M. J. & Denu, J. M. (2016). Mechanisms and Dynamics of Protein Acetylation in Mitochondria. Trends in Biochemical Sciences, 41, 231-244. Baggetto, L. G. (1992). Role of mitochondria in carcinogenesis. European journal of cancer, 29A, 156-159. Baggetto, L. G. & Lehninger, A. L. (1987a). Formation and utilization of acetoin, an unusual product of pyruvate metabolism by Ehrlich and AS30-D tumor mitochondria. The Journal of biological chemistry, 262, 9535-9541. Baggetto, L. G. & Lehninger, A. L. (1987b). Isolated tumoral pyruvate dehydrogenase can synthesize acetoin which inhibits pyruvate oxidation as well as other aldehydes. Biochemical and biophysical research communications, 145, 153-159. Bajotto, G., Murakami, T., Nagasaki, M., Qin, B., Matsuo, Y., Maeda, K., Ohashi, M., Oshida, Y., Sato, Y. & Shimomura, Y. (2006). Increased expression of hepatic pyruvate dehydrogenase kinases 2 and 4 in young and middle-aged Otsuka Long-Evans Tokushima Fatty rats: induction by elevated levels of free fatty acids. Metabolism: clinical and experimental, 55, 317-323. Bajotto, G., Murakami, T., Nagasaki, M., Tamura, T., Tamura, N., Harris, R. A., Shimomura, Y. & Sato, Y. (2004). Downregulation of the skeletal muscle pyruvate dehydrogenase complex in the Otsuka Long-Evans Tokushima Fatty rat both before and after the onset of diabetes mellitus. Life sciences, 75, 2117-2130. Balakrishnan, A., Jordan, F. & Nathan, C. F. (2013). Influence of allosteric regulators on individual steps in the reaction catalysed by Mycobacterium tuberculosis 2-hydroxy-3-oxoadipate synthase. The Journal of biological chemistry, 288, 21688-21702. Ballou, D., Palmer, G. & Massey, V. (1969). Direct demonstration of superoxide anion production during the oxidation of reduced flavin and of its catalytic decomposition by erythrocuprein. Biochemical and biophysical research communications, 36, 898-904. Bao, H., Kasten, S. A., Yan, X., Hiromasa, Y. & Roche, T. E. (2004). Pyruvate dehydrogenase kinase isoform 2 activity stimulated by speeding up the rate of dissociation of ADP. Biochemistry, 43, 13442-13451. Bardella, C., Pollard, P. J. & Tomlinson, I. (2011). SDH mutations in cancer. Biochimica et biophysica acta, 1807, 1432-1443. Barletta, G., Chung, A. C., Rios, C. B., Jordan, F. & Schlegel, J. M. (1990). Electrochemical oxidation of enamines related to the key intermediate on thiamine diphosphate dependent enzymatic pathways: evidence for one-electron oxidation via a thiazolium cation radical. Journal of the American Chemical Society, 112, 8144-8149. Barthe, P., Roumestand, C., Canova, M. J., Kremer, L., Hurard, C., Molle, V. & Cohen-Gonsaud, M. (2009). Dynamic and structural characterization of a bacterial FHA protein reveals a new autoinhibition mechanism. Structure, 17, 568-578. Bates, D. L., Harrison, R. A. & Perham, R. N. (1975). The stoichiometry of polypeptide chains in the pyruvate dehydrogenase multienzyme complex of E. coli determined by a simple novel method. FEBS letters, 60, 427-430. Benen, J., van Berkel, W., Dieteren, N., Arscott, D., Williams, C., Jr., Veeger, C. & de Kok, A. (1992a). Lipoamide dehydrogenase from Azotobacter vinelandii: site-directed mutagenesis of the His450-Glu455 diad. Kinetics of wild-type and mutated enzymes. European journal of biochemistry/FEBS, 207, 487-497. Benen, J., van Berkel, W., Veeger, C. & de Kok, A. (1992b). Lipoamide dehydrogenase from Azotobacter vinelandii. The role of the C-terminus in catalysis and dimer stabilization. European journal of biochemistry/FEBS, 207, 499-505. Benen, J., van Berkel, W., Zak, Z., Visser, T., Veeger, C. & de Kok, A. (1991). Lipoamide dehydrogenase from Azotobacter vinelandii: site-directed mutagenesis of the His450-Glu455 diad. Spectral properties of wild type and mutated enzymes. European journal of biochemistry/FEBS, 202, 863-872. Berg, A. & de Kok, A. (1997). 2-Oxo acid dehydrogenase multienzyme complexes. The central role of the lipoyl domain. Biological chemistry, 378, 617-634. Berg, A., de Kok, A. & Vervoort, J. (1994). Sequential 1H and 15N nuclear magnetic resonance assignments and secondary structure of the N-terminal lipoyl domain of the dihydrolipoyl transacetylase component of the pyruvate dehydrogenase complex from Azotobacter vinelandii. European journal of biochemistry/FEBS, 221, 87-100. Berg, A., Smits, O., de Kok, A. & Vervoort, J. (1995). Sequential 1H and 15N nuclear magnetic resonance assignments and secondary structure of the lipoyl domain of the 2-oxoglutarate dehydrogenase complex from Azotobacter vinelandii. Evidence for high structural similarity with the lipoyl domain of the pyruvate dehydrogenase complex. European journal of biochemistry/FEBS, 234, 148-159. Berg, A., Vervoort, J. & de Kok, A., 1997. Three-dimensional structure in solution of the N-terminal lipoyl domain of the pyruvate dehydrogenase complex from Azotobacter vinelandii. European journal of biochemistry/FEBS, 244, 352-360. Berg, A., Westphal, A. H., Bosma, H. J. & de Kok, A. (1998). Kinetics and specificity of reductive acylation of wild-type and mutated lipoyl domains of 2-oxo-acid dehydrogenase complexes from Azotobacter vinelandii. European journal of biochemistry/FEBS, 252, 45-50. Bernal, V., Castano-Cerezo, S., Gallego-Jara, J., Ecija-Conesa, A., de Diego, T., Iborra, J. L. & Canovas, M. (2014). Regulation of bacterial physiology by lysine acetylation of proteins. New biotechnology, 31, 586-595. Bhute, V. J. & Palecek, S. P. (2015). Metabolic responses induced by DNA damage and poly (ADP-ribose) polymerase (PARP) inhibition in MCF-7 cells. Metabolomics: Official journal of the Metabolomic Society, 11, 1779-1791. Bielarczyk, H., Jankowska-Kulawy, A., Hofling, C., Ronowska, A., Gul-Hinc, S., Rossner, S., Schliebs, R., Pawelczyk, T. & Szutowicz, A. (2015). AbetaPP-Transgenic 2576 Mice Mimic Cell Type-Specific Aspects of Acetyl-CoA-Linked Metabolic Deficits in Alzheimer’s Disease. Journal of Alzheimer’s disease, 48, 1083-1094. Bisswanger, H. (1981). Substrate specificity of the pyruvate dehydrogenase complex from Escherichia coli. The Journal of biological chemistry, 256, 815-822. Bisswanger, H., Raddatz, G. & Loeffelhardt, S. (1996). Substrate binding to the dihydrolipoamide dehydrogenase and implications for the interaction of the lipoyl domains in the bacterial pyruvate dehydrogenase complex. In H. Bisswanger & A. Schellenberger (Eds. ), Biochemistry and physiology of thiamine diphosphate enzymes, (pp. 261-271). Prien: A.u.C. Intemann. Bizon-Zygmanska, D., Jankowska-Kulawy, A., Bielarczyk, H., Pawelczyk, T., Ronowska, A., Marszall, M. & Szutowicz, A. (2011). Acetyl-CoA metabolism in amprolium-evoked thiamine pyrophosphate deficits in cholinergic SN56 neuroblastoma cells. Neurochemistry international, 59, 208-216. Bleile, D. M., Munk, P., Oliver, R. M. & Reed, L. J. (1979). Subunit structure of dihydrolipoyl transacetylase component of pyruvate dehydrogenase complex from Escherichia coli. Proceedings of the National Academy of Sciences of the United States of America, 76, 4385-4389. Blumenstiel, K., Schoneck, R., Yardley, V., Croft, S. L. & Krauth-Siegel, R. L. (1999). Nitrofuran drugs as common subversive substrates of Trypanosoma cruzi lipoamide dehydrogenase and trypanothione reductase. Biochemical pharmacology, 58, 1791-1799. Bonnet, S., Archer, S. L., Allalunis-Turner, J., Haromy, A., Beaulieu, C., Thompson, R., Lee, C. T., Lopaschuk, G. D., Puttagunta, L., Bonnet, S., Harry, G., Hashimoto, K., Porter, C. J., Andrade, M. A., Thebaud, B. & Michelakis, E. D. (2007). A mitochondria-K+ channel axis is suppressed in cancer and its normalization promotes apoptosis and inhibits cancer growth. Cancer cell, 11, 37-51. Bonnet, S., Michelakis, E. D., Porter, C. J., Andrade-Navarro, M. A., Thebaud, B., Bonnet, S., Haromy, A., Harry, G., Moudgil, R., McMurtry, M. S., Weir, E. K. & Archer, S. L. (2006). An abnormal mitochondrial-hypoxia inducible factor-1alpha-Kv channel pathway disrupts oxygen sensing and triggers pulmonary arterial hypertension in fawn hooded rats: similarities to human pulmonary arterial hypertension. Circulation, 113, 2630-2641. Bonomi, F., Cerioli, A. & Pagani, S. (1989). Molecular aspects of the removal of ferritin-bound iron by DL-dihydrolipoate. Biochimica et biophysica acta, 994, 180-186. Borgnia, M. J., Shi, D., Zhang, P. & Milne, J. L. (2004). Visualization of alpha-helical features in a density map constructed using 9 molecular images of the 1.8 MDa icosahedral core of pyruvate dehydrogenase. Journal of structural biology, 147, 136-145. Bosma, H. J., de Kok, A., Westphal, A. H. & Veeger, C. (1984). The composition of the pyruvate dehydrogenase complex from Azotobacter vinelandii. Does a unifying model exist for the complexes from gram-negative bacteria? European journal of biochemistry/FEBS, 142, 541-549. Bott, M. (2007). Offering surprises: TCA cycle regulation in Corynebacterium glutamicum. Trends in microbiology, 15, 417-425. Brautigam, C. A., Chuang, J. L., Tomchick, D. R., Machius, M. & Chuang, D. T. (2005). Crystal structure of human dihydrolipoamide dehydrogenase: NAD+/NADH binding and the structural basis of disease-causing mutations. Journal of molecular biology, 350, 543-552. Brautigam, C. A., Wynn, R. M., Chuang, J. L., Machius, M., Tomchick, D. R. & Chuang, D. T. (2006). Structural insight into interactions between dihydrolipoamide dehydrogenase (E3) and E3 binding protein of human pyruvate dehydrogenase complex. Structure, 14, 611-621. Brautigam, C. A., Wynn, R. M., Chuang, J. L., Naik, M. T., Young, B. B., Huang, T. H. & Chuang, D. T. (2011). Structural and thermodynamic basis for weak interactions between dihydrolipoamide dehydrogenase and subunit-binding domain of the branched-chain alpha-ketoacid dehydrogenase complex. The Journal of biological chemistry, 286, 23476-23488. Breslow, R. (1957). Rapid deuterium exchange in thiazolinium salts Journal of the American Chemical Society, 79, 1762-1763. Breslow, R. (1958). On the mechanism of thiamine action. IV. Evidence from studies on model systems. Journal of the American Chemical Society, 80, 3719-3726. Breslow, R. & McNelis, E. (1959). Studies on model systems for thiamine action. Synthesis of reactive intermediatesand evidence on the function of the pyrimidine ring. Journal of the American Chemical Society, 81, 3080-3082. Bresters, T. W., de Abreu, R. A., de Kok, A., Visser, J. & Veeger, C. (1975). The pyruvate-dehydrogenase complex from Azotobacter vinelandii. European journal of biochemistry/FEBS, 59, 335-345. Briere, J. J., Favier, J., Gimenez-Roqueplo, A. P. & Rustin, P. (2006). Tricarboxylic acid cycle dysfunction as a cause of human diseases and tumor formation. American journal of physiology Cell physiology, 291, C1114-1120. Brocklehurst, S. M. & Perham, R. N. (1993). Prediction of the three-dimensional structures of the biotinylated domain from yeast pyruvate carboxylase and of the lipoylated H-protein from the pea leaf glycine cleavage system: a new automated method for the prediction of protein tertiary structure. Protein science: a publication of the Protein Society, 2, 626-639. Bryk, R., Lima, C. D., Erdjument-Bromage, H., Tempst, P. & Nathan, C. (2002). Metabolic enzymes of mycobacteria linked to antioxidant defense by a thioredoxin-like protein. Science, 295, 1073-1077. Bunik, V. (2000). Increased catalytic performance of the 2-oxoacid dehydrogenase complexes in the presence of thioredoxin, a thiol-disulfide oxidoreductase. J Mol Catal B-Enzym, 8, 165-174. Bunik, V. & Follmann, H. (1993). Thioredoxin reduction dependent on alpha-ketoacid oxidation by alpha-ketoacid dehydrogenase complexes. FEBS letters, 336, 197-200. Bunik, V., Follmann, H. & Bisswanger, H. (1997). Activation of mitochondrial 2-oxoacid dehydrogenases by thioredoxin. Biological chemistry, 378, 1125-1130. Bunik, V., Kaehne, T., Degtyarev, D., Shcherbakova, T. & Reiser, G. (2008). Novel isoenzyme of 2-oxoglutarate dehydrogenase is identified in brain, but not in heart. The FEBS journal, 275, 4990-5006. Bunik, V., Mkrtchyan, G., Grabarska, A., Oppermann, H., Daloso, D., Araujo, W. L., Juszczak, M., Rzeski, W., Bettendorff, L., Fernie, A. R., Meixensberger, J., Stepulak, A. & Gaunitz, F. (2016). Inhibition of mitochondrial 2-oxoglutarate dehydrogenase impairs viability of cancer cells in a cell-specific metabolism-dependent manner. Oncotarget. Bunik, V. & Pavlova, O. (1996). Interaction of 2-oxoglutarate dehydrogenase with 2-oxosubstrates and their structural analogues. In H. Bisswanger & A. Schellenberger (Eds. ), Biochemistry and physiology of thiamine diphosphate enzymes, (pp. 367-373). Prien: A.u.C. Intemann. Bunik, V., Raddatz, G., Lemaire, S., Meyer, Y., Jacquot, J. P. & Bisswanger, H. (1999). Interaction of thioredoxins with target proteins: role of particular structural elements and electrostatic properties of thioredoxins in their interplay with 2-oxoacid dehydrogenase complexes. Protein science: a publication of the Protein Society, 8, 65-74. Bunik, V., Shoubnikova, A., Loeffelhardt, S., Bisswanger, H., Borbe, H. O. & Follmann, H. (1995). Using lipoate enantiomers and thioredoxin to study the mechanism of the 2-oxoacid-dependent dihydrolipoate production by the 2-oxoacid dehydrogenase complexes. FEBS letters, 371, 167-170. Bunik, V., Westphal, A. H. & de Kok, A. (2000). Kinetic properties of the 2-oxoglutarate dehydrogenase complex from Azotobacter vinelandii evidence for the formation of a precatalytic complex with 2-oxoglutarate. European journal of biochemistry/FEBS, 267, 3583-3591. Bunik, V. I., 2001. Regulation of multienzyme complexes of 2-oxo acid dehydrogenases. Professorial Thesis (habil.) (Dr. Sci. Dissertation), Lomonosov Moscow State University, Moscow, Russia. Bunik, V. I. (2003). 2-Oxo acid dehydrogenase complexes in redox regulation. European journal of biochemistry/FEBS, 270, 1036-1042. Bunik, V. I. & Aleshin, V. A. (2017). Analysis of the protein binding sites for thiamine and its derivatives to elucidate molecular mechanisms of the non-coenzyme action of thiamine (vitamin B1). Studies in Natural Products Chemistry, 53, 374-429. Bunik, V. I., Artiukhov, A., Kazantsev, A., Goncalves, R., Daloso, D., Oppermann, H., Kulakovskaya, E., Lukashev, N., Fernie, A., Brand, M. & Gaunitz, F. (2015). Specific inhibition by synthetic analogues of pyruvate reveals that the pyruvate dehydrogenase reaction is essential for metabolism and viability of glioblastoma cells. Oncotarget, 6, 40036-40052. Bunik, V. I., Biryukov, A. I. & Zhukov Yu, N. (1992). Inhibition of pigeon breast muscle alpha-ketoglutarate dehydrogenase by phosphonate analogues of alpha-ketoglutarate. FEBS letters, 303, 197-201. Bunik, V. I. & Degtyarev, D. (2008). Structure-function relationships in the 2-oxo acid dehydrogenase family: substrate-specific signatures and functional predictions for the 2-oxoglutarate dehydrogenase-like proteins. Proteins, 71, 874-890. Bunik, V. I., Denton, T. T., Xu, H., Thompson, C. M., Cooper, A. J. & Gibson, G. E. (2005). Phosphonate analogues of alpha-ketoglutarate inhibit the activity of the alpha-ketoglutarate dehydrogenase complex isolated from brain and in cultured cells. Biochemistry, 44, 10552-10561. Bunik, V. I. & Fernie, A. R. (2009). Metabolic control exerted by the 2-oxoglutarate dehydrogenase reaction: a cross-kingdom comparison of the crossroad between energy production and nitrogen assimilation. The Biochemical journal, 422, 405-421. Bunik, V. I. & Gomazkova, V. S. (1987). [Functional role of histidine residues of alpha-ketoglutarate dehydrogenase]. Biokhimiia, 52, 1235-1247. Bunik, V. I. & Gomazkova, V. S. (1996). Study of 2-oxoglutarate dehydrogenase by the method of chemical modification of amino acid residues. In B. I. Kurganov, N. K. Nagradova & O. I. Lavrik (Eds. ), Chemical modification of enzymes, (pp. 479-521). New York: Nova Science Publishers. Bunik, V. I., Kabysheva, M. S., Klimuk, E. I., Storozhevykh, T. P. & Pinelis, V. G. (2009). Phosphono analogues of 2-oxoglutarate protect cerebellar granule neurons upon glutamate excitotoxicity. Annals of the New York Academy of Sciences, 1171, 521-529. Bunik, V. I. & Pavlova, O. G. (1993). Inactivation of alpha-ketoglutarate dehydrogenase during oxidative decarboxylation of alpha-ketoadipic acid. FEBS letters, 323, 166-170. Bunik, V. I. & Pavlova, O. G. (1997). Inactivation of alpha-ketoglutarate dehydrogenase during its enzymatic reaction. Biochemistry (Mosc), 62, 973-982. Bunik, V. I., Raddatz, G. & Strumilo, S. A. (2013a). Translating enzymology into metabolic regulation: the case of the 2- oxoglutarate dehydrogenase multienzyme complex. Current chemical biology, 7, 74-93. Bunik, V. I., Raddatz, G., Wanders, R. J. & Reiser, G. (2006). Brain pyruvate and 2-oxoglutarate dehydrogenase complexes are mitochondrial targets of the CoA ester of the Refsum disease marker phytanic acid. FEBS letters, 580, 3551-3557. Bunik, V. I., Romash, O. G. & Gomazkova, V. S. (1990). Inactivation of alpha-ketoglutarate dehydrogenase during enzyme-catalysed reaction. Biochemistry international, 22, 967-976. Bunik, V. I., Schloss, J. V., Pinto, J. T., Dudareva, N. & Cooper, A. J. (2011). A survey of oxidative paracatalytic reactions catalysed by enzymes that generate carbanionic intermediates: implications for ROS production, cancer etiology, and neurodegenerative diseases. Advances in enzymology and related areas of molecular biology, 77, 307-360. Bunik, V. I., Schloss, J. V., Pinto, J. T., Gibson, G. E. & Cooper, A. J. (2007). Enzyme-catalysed side reactions with molecular oxygen may contribute to cell signalling and neurodegenerative diseases. Neurochemical research, 32, 871-891. Bunik, V. I. & Sievers, C. (2002). Inactivation of 2-oxo acid dehydrogenase complexes upon generation of intrinsic radical species. European journal of biochemistry/FEBS, 269, 5004-5015. Bunik, V. I., Tylicki, A. & Lukashev, N. V. (2013b). Thiamine diphosphate-dependent enzymes: from enzymology to metabolic regulation, drug design and disease models. The FEBS journal, 280, 6412-6442. Burns, G., Sykes, P. J., Hatter, K. & Sokatch, J. R. (1989). Isolation of a third lipoamide dehydrogenase from Pseudomonas putida. Journal of bacteriology, 171, 665-668. Cairns, R. A., Harris, I. S. & Mak, T. W. (2011). Regulation of cancer cell metabolism. Nature reviews Cancer, 11, 85-95. CaJacob, C. A., Frey, P. A., Hainfeld, J. F., Wall, J. S. & Yang, H. (1985). Escherichia coli pyruvate dehydrogenase complex: particle masses of the complex and component enzymes measured by scanning transmission electron microscopy. Biochemistry, 24, 2425-2431. Candy, J. M., Koga, J., Nixon, P. F. & Duggleby, R. G. (1996). The role of residues glutamate-50 and phenylalanine-496 in Zymomonas mobilis pyruvate decarboxylase. The Biochemical journal, 315, 745-751. Carothers, D. J., Pons, G. & Patel, M. S. (1989). Dihydrolipoamide dehydrogenase: functional similarities and divergent evolution of the pyridine nucleotide-disulfide oxidoreductases. Archives of biochemistry and biophysics, 268, 409-425. Cassey, B., Guest, J. R. & Attwood, M. M. (1998). Environmental control of pyruvate dehydrogenase complex expression in Escherichia coli. FEMS microbiology letters, 159, 325-329. Chambers, K. T., Leone, T. C., Sambandam, N., Kovacs, A., Wagg, C. S., Lopaschuk, G. D., Finck, B. N. & Kelly, D. P. (2011). Chronic inhibition of pyruvate dehydrogenase in heart triggers an adaptive metabolic response. The Journal of biological chemistry, 286, 11155-11162. Chen, B., Liu, Y., Jin, X., Lu, W., Liu, J., Xia, Z., Yuan, Q., Zhao, X., Xu, N. & Liang, S. (2014). MicroRNA-26a regulates glucose metabolism by direct targeting PDHX in colorectal cancer cells. BMC cancer, 14, 443. Chen, H. J., Chen, Y. M. & Chang, C. M. (2002). Lipoyl dehydrogenase catalyses reduction of nitrated DNA and protein adducts using dihydrolipoic acid or ubiquinol as the cofactor. Chemico-biological interactions, 140, 199-213. Chen, W., Huang, X., Komuniecki, P. R. & Komuniecki, R. (1998). Molecular cloning, functional expression, and characterization of pyruvate dehydrogenase kinase from anaerobic muscle of the parasitic nematode Ascaris suum. Archives of biochemistry and biophysics, 353, 181-189. Cheng, S. C. & Nakamura, R. (1970). A study on the tricarboxylic acid cycle and the synthesis of acetylcholine in the lobster nerve. The Biochemical journal, 118, 451-455. Chuang, D. T., Chuang, J. L. & Wynn, R. M. (2006). Lessons from genetic disorders of branched-chain amino acid metabolism. The Journal of nutrition, 136, 243S-249S. Chuang, D. T., Hu, C. W., Ku, L. S., Markovitz, P. J. & Cox, R. P. (1985). Subunit structure of the dihydrolipoyl transacylase component of branched-chain alpha-keto acid dehydrogenase complex from bovine liver. Characterization of the inner transacylase core. The Journal of biological chemistry, 260, 13779-13786. Ciszak, E. M., Korotchkina, L. G., Dominiak, P. M., Sidhu, S. & Patel, M. S. (2003). Structural basis for flip-flop action of thiamine pyrophosphate-dependent enzymes revealed by human pyruvate dehydrogenase. The Journal of biological chemistry, 278, 21240-21246. Ciszak, E. M., Makal, A., Hong, Y. S., Vettaikkorumakankauv, A. K., Korotchkina, L. G. & Patel, M. S. (2006). How dihydrolipoamide dehydrogenase-binding protein binds dihydrolipoamide dehydrogenase in the human pyruvate dehydrogenase complex. The Journal of biological chemistry, 281, 648-655. Cole, J. T., Sweatt, A. J. & Hutson, S. M. (2012). Expression of mitochondrial branched-chain aminotransferase and alpha-keto-acid dehydrogenase in rat brain: implications for neurotransmitter metabolism. Frontiers in neuroanatomy, 6, 18. Collins, J. H. & Reed, L. J. (1977). Acyl group and electron pair relay system: a network of interacting lipoyl moieties in the pyruvate and alpha-ketoglutarate dehydrogenase complexes from Escherichia coli. Proceedings of the National Academy of Sciences of the United States of America, 74, 4223-4227. Comin-Anduix, B., Boren, J., Martinez, S., Moro, C., Centelles, J. J., Trebukhina, R., Petushok, N., Lee, W. N., Boros, L. G. & Cascante, M. (2001). The effect of thiamine supplementation on tumour proliferation. A metabolic control analysis study. European journal of biochemistry/FEBS, 268, 4177-4182. Conner, M., Krell, T. & Lindsay, J. G. (1996). Identification and purification of a distinct dihydrolipoamide dehydrogenase from pea chloroplasts. Planta, 200, 195-202. Contrusciere, V., Paradisi, S., Matteucci, A. & Malchiodi-Albedi, F. (2010). Branched-chain amino acids induce neurotoxicity in rat cortical cultures. Neurotoxicity research, 17, 392-398. Cooney, G. J., Taegtmeyer, H. & Newsholme, E. A. (1981). Tricarboxylic acid cycle flux and enzyme activities in the isolated working rat heart. The Biochemical journal, 200, 701-703. Corthay, J., Dunant, Y., Eder, L. & Loctin, F. (1985). Incorporation of acetate into acetylcholine, acetylcarnitine, and amino acids in the Torpedo electric organ. Journal of neurochemistry, 45, 1809-1819. Cussiol, J. R., Alegria, T. G., Szweda, L. I. & Netto, L. E. (2010). Ohr (organic hydroperoxide resistance protein) possesses a previously undescribed activity, lipoyl-dependent peroxidase. The Journal of biological chemistry, 285, 21943-21950. Dahl, H. H., Hunt, S. M., Hutchison, W. M. & Brown, G. K. (1987). The human pyruvate dehydrogenase complex. Isolation of cDNA clones for the E1 alpha subunit, sequence analysis, and characterization of the mRNA. The Journal of biological chemistry, 262, 7398-7403. Damuni, Z., Humphreys, J. S. & Reed, L. J. (1984). Stimulation of pyruvate dehydrogenase phosphatase activity by polyamines. Biochemical and biophysical research communications, 124, 95-99. Damuni, Z., Humphreys, J. S. & Reed, L. J. (1986). A potent, heat-stable protein inhibitor of [branched-chain alpha-keto acid dehydrogenase]-phosphatase from bovine kidney mitochondria. Proceedings of the National Academy of Sciences of the United States of America, 83, 285-289. Damuni, Z., Lim Tung, H. Y. & Reed, L. J. (1985). Specificity of the heat-stable protein inhibitor of the branched-chain alpha-keto acid dehydrogenase phosphatase. Biochemical and biophysical research communications, 133, 878-883. Damuni, Z. & Reed, L. J. (1988). Branched-chain alpha-keto acid dehydrogenase phosphatase and its inhibitor protein from bovine kidney. Methods in enzymology, 166, 321-329. Danhauser, K., Sauer, S. W., Haack, T. B., Wieland, T., Staufner, C., Graf, E., Zschocke, J., Strom, T. M., Traub, T., Okun, J. G., Meitinger, T., Hoffmann, G. F., Prokisch, H. & Kolker, S. (2012). DHTKD1 mutations cause 2-aminoadipic and 2-oxoadipic aciduria. American journal of human genetics, 91, 1082-1087. Danner, D. J., Lemmon, S. K., Besharse, J. C. & Elsas, L. J. 2nd, (1979). Purification and characterization of branched-chain alpha-ketoacid dehydrogenase from bovine liver mitochondria. The Journal of biological chemistry, 254, 5522-5526. Danner, D. J., Lemmon, S. K. & Elsas, L. J. 2nd, (1978). Substrate specificity and stabilization by thiamine pyrophosphate of rat liver branched-chain alpha-ketoacid dehydrogenase. Biochemical medicine, 19, 27-38. Danson, M. J., Hale, G., Johnson, P., Perham, R. N., Smith, J. & Spragg, P. (1979). Molecular weight and symmetry of the pyruvate dehydrogenase multienzyme complex of Escherichia coli. Journal of molecular biology, 129, 603-617. Danson, M. J., Hooper, E. A. & Perham, R. N. (1978). Intramolecular coupling of active sites in the pyruvate dehydrogenase multienzyme complex of Escherichia coli. The Biochemical journal, 175, 193-198. Danson, M. J. & Perham, R. N. (1976). Evidence for two lipoic acid residues per lipoate acetyltransferase chain in the pyruvate dehydrogenase multienzyme complex of Escherichia coli. The Biochemical journal, 159, 677-682. Dardel, F., Davis, A. L., Laue, E. D. & Perham, R. N. (1993). Three-dimensional structure of the lipoyl domain from Bacillus stearothermophilus pyruvate dehydrogenase multienzyme complex. Journal of molecular biology, 229, 1037-1048. Dardel, F., Packman, L. C. & Perham, R. N. (1990). Expression in Escherichia coli of a sub-gene encoding the lipoyl domain of the pyruvate dehydrogenase complex of Bacillus stearothermophilus. FEBS letters, 264, 206-210. Dave, E., Guest, J. R. & Attwood, M. M. (1995). Metabolic engineering in Escherichia coli: lowering the lipoyl domain content of the pyruvate dehydrogenase complex adversely affects the growth rate and yield. Microbiology, 141, 1839-1849.
de Kok, A., Hengeveld, A. F., Martin, A. & Westphal, A. H. (1998). The pyruvate dehydrogenase multi-enzyme complex from Gram-negative bacteria. Biochimica et biophysica acta, 1385, 353-366.
de Kok, A., Kornfeld, S., Benziman, M. & Milner, Y. (1980). Subunit composition and partial reactions of the 2-oxoglutarate dehydrogenase complex of Acetobacter xylinum. European journal of biochemistry/FEBS, 106, 49-58.
de Kok, A. & van Berkel, W. J. H. (1996). Lipoamide dehydrogenase. In M. S. Patel, T. E. Roche & R. A. Harris (Eds. ), Alphа-keto acid dehydrogenase complexes, (pp. 53-70). Basel-Boston-Berlin: Birkhaeuser Verlag. De Marcucci, O. & Lindsay, J. G. (1985). Component X. An immunologically distinct polypeptide associated with mammalian pyruvate dehydrogenase multi-enzyme complex. European journal of biochemistry/FEBS, 149, 641-648. DeBrosse, S. D., Okajima, K., Zhang, S., Nakouzi, G., Schmotzer, C. L., Lusk-Kopp, M., Frohnapfel, M. B., Grahame, G. & Kerr, D. S. (2012). Spectrum of neurological and survival outcomes in pyruvate dehydrogenase complex (PDC) deficiency: lack of correlation with genotype. Molecular genetics and metabolism, 107, 394-402. Denton, R. M., Pullen, T. J., Armstrong, C. T., Heesom, K. J. & Rutter, G. A. (2016). Calcium-insensitive splice variants of mammalian E1 subunit of 2-oxoglutarate dehydrogenase complex with tissue-specific patterns of expression. The Biochemical journal, 473, 1165-1178. Diaz-Munoz, M. D., Bell, S. E., Fairfax, K., Monzon-Casanova, E., Cunningham, A. F., Gonzalez-Porta, M., Andrews, S. R., Bunik, V. I., Zarnack, K., Curk, T., Heggermont, W. A., Heymans, S., Gibson, G. E., Kontoyiannis, D. L., Ule, J. & Turner, M. (2015). The RNA-binding protein HuR is essential for the B cell antibody response. Nature immunology, 16, 415-425. Docampo, R., Moreno, S. N. & Mason, R. P. (1987). Free radical intermediates in the reaction of pyruvate: ferredoxin oxidoreductase in Trichomonas foetus hydrogenosomes. The Journal of biological chemistry, 262, 12417-12420. Dolezal, V. & Tucek, S. (1981). Utilization of citrate, acetylcarnitine, acetate, pyruvate and glucose for the synthesis of acetylcholine in rat brain slices. Journal of neurochemistry, 36, 1323-1330. Eley, M. H., Namihira, G., Hamilton, L., Munk, P. & Reed, L. J. (1972). -Keto acid dehydrogenase complexes. 18. Subunit composition of the Escherichia coli pyruvate dehydrogenase complex. Archives of biochemistry and biophysics, 152, 655-669. Ermer, J., Schellenberger, A. & Hubner, G. (1992). Kinetic mechanism of pyruvate decarboxylase. Evidence for a specific protonation of the enzymic intermediate. FEBS letters, 299, 163-165. Fan, J., Kamphorst, J. J., Rabinowitz, J. D. & Shlomi, T. (2013). Fatty acid labeling from glutamine in hypoxia can be explained by isotope exchange without net reductive isocitrate dehydrogenase (IDH) flux. The Journal of biological chemistry, 288, 31363-31369. Fan, J., Kang, H. B., Shan, C., Elf, S., Lin, R., Xie, J., Gu, T. L., Aguiar, M., Lonning, S., Chung, T. W., Arellano, M., Khoury, H. J., Shin, D. M., Khuri, F. R., Boggon, T. J., Kang, S. & Chen, J. (2014a). Tyr-301 phosphorylation inhibits pyruvate dehydrogenase by blocking substrate binding and promotes the Warburg effect. The Journal of biological chemistry, 289, 26533-26541. Fan, J., Shan, C., Kang, H. B., Elf, S., Xie, J., Tucker, M., Gu, T. L., Aguiar, M., Lonning, S., Chen, H., Mohammadi, M., Britton, L. M., Garcia, B. A., Aleckovic, M., Kang, Y., Kaluz, S., Devi, N., Van Meir, E. G., Hitosugi, T., Seo, J. H., Lonial, S., Gaddh, M., Arellano, M., Khoury, H. J., Khuri, F. R., Boggon, T. J., Kang, S. & Chen, J. (2014b). Tyr phosphorylation of PDP1 toggles recruitment between ACAT1 and SIRT3 to regulate the pyruvate dehydrogenase complex. Molecular cell, 53, 534-548. Fang, R., Nixon, P. F. & Duggleby, R. G. (1998). Identification of the catalytic glutamate in the E1 component of human pyruvate dehydrogenase. FEBS letters, 437, 273-277. Fedorova, M. S., Kudryavtseva, A. V., Lakunina, V. A., Snezhkina, A. V., Volchenko, N. N., Slavnova, E. N., Danilova, T. V., Sadritdinova, A. F., Melnikova, N. V., Belova, A. A., Klimina, K. M., Sidorov, D. V., Alekseev, B. Y., Kaprin, A. D., Dmitriev, A. A. & Krasnov, G. S. 2015. [Downregulation of OGDHL expression is associated with promoter hypermethylation in colorectal cancer]. Molekuliarnaia biologiia, 49, 678-688. Filipp, F. V., Scott, D. A., Ronai, Z. A., Osterman, A. L. & Smith, J. W. (2012). Reverse TCA cycle flux through isocitrate dehydrogenases 1 and 2 is required for lipogenesis in hypoxic melanoma cells. Pigment cell & melanoma research, 25, 375-383. Flournoy, D. S. & Frey, P. A. (1986). Pyruvate dehydrogenase and 3-fluoropyruvate: chemical competence of 2-acetylthiamine pyrophosphate as an acetyl group donor to dihydrolipoamide. Biochemistry, 25, 6036-6043. Fraaije, M. W. & Mattevi, A. (2000). Flavoenzymes: diverse catalysts with recurrent features. Trends in Biochemical Sciences, 25, 126-132. Frank, R. A., Kay, C. W., Hirst, J. & Luisi, B. F. (2008). Off-pathway, oxygen-dependent thiamine radical in the Krebs cycle. Journal of the American Chemical Society, 130, 1662-1668. Frank, R. A., Price, A. J., Northrop, F. D., Perham, R. N. & Luisi, B. F. (2007). Crystal structure of the E1 component of the Escherichia coli 2-oxoglutarate dehydrogenase multienzyme complex. Journal of molecular biology, 368, 639-651. Frank, R. A., Titman, C. M., Pratap, J. V., Luisi, B. F. & Perham, R. N. (2004). A molecular switch and proton wire synchronize the active sites in thiamine enzymes. Science, 306, 872-876. Frey, P. A. (1989). 2-Acetylthiamine pyrophosphate: an enzyme-bound intermediate in thiamine pyrophosphate-dependent reactions. BioFactors, 2, 1-9. Frey, P. A., Flournoy, D. S., Gruys, K. & Yang, Y. S. (1989). Intermediates in reductive transacetylation catalysed by pyruvate dehydrogenase complex. Annals of the New York Academy of Sciences, 573, 21-35. Fries, M., Chauhan, H. J., Domingo, G. J., Jung, H. I. & Perham, R. N. (2003a). Site-directed mutagenesis of a loop at the active site of E1 (alpha2beta2) of the pyruvate dehydrogenase complex. A possible common sequence motif. European journal of biochemistry/FEBS, 270, 861-870. Fries, M., Jung, H. I. & Perham, R. N. (2003b). Reaction mechanism of the heterotetrameric (alpha2beta2) E1 component of 2-oxo acid dehydrogenase multienzyme complexes. Biochemistry, 42, 6996-7002. Fujisawa, K., Terai, S., Takami, T., Yamamoto, N., Yamasaki, T., Matsumoto, T., Yamaguchi, K., Owada, Y., Nishina, H., Noma, T. & Sakaida, I. (2016). Modulation of anti-cancer drug sensitivity through the regulation of mitochondrial activity by adenylate kinase 4. Journal of experimental & clinical cancer research, 35, 48. Fujiwara, K., Okamura-Ikeda, K. & Motokawa, Y. (1997). Lipoate addition to acyltransferases of alpha-keto acid dehydrogenase complexes and H-protein of glycine cleavage system. Methods in enzymology, 279, 184-193. Fukui, S., Ohishi, N., Kishimotostakamizaw, A. & Hamazima, Y. (1965). Formation of “Thiaminosuccinic Acid” as an Intermediate in the Transformation of Oxythiamine to Thiamine by a Thiamineless Mutant of Escherichia Coli. The Journal of biological chemistry, 240, 1315-1321. Funchal, C., Gottfried, C., De Almeida, L. M., Wajner, M. & Pessoa-Pureur, R. (2004). Evidence that the branched-chain alpha-keto acids accumulating in maple syrup urine disease induce morphological alterations and death in cultured astrocytes from rat cerebral cortex. Glia, 48, 230-240. Funchal, C., Latini, A., Jacques-Silva, M. C., Dos Santos, A. Q., Buzin, L., Gottfried, C., Wajner, M. & Pessoa-Pureur, R. (2006). Morphological alterations and induction of oxidative stress in glial cells caused by the branched-chain alpha-keto acids accumulating in maple syrup urine disease. Neurochemistry international, 49, 640-650. Gazaryan, I. G., Krasinskaya, I. P., Kristal, B. S. & Brown, A. M. (2007). Zinc irreversibly damages major enzymes of energy production and antioxidant defense prior to mitochondrial permeability transition. The Journal of biological chemistry, 282, 24373-24380. Gazaryan, I. G., Krasnikov, B. F., Ashby, G. A., Thorneley, R. N., Kristal, B. S. & Brown, A. M. (2002). Zinc is a potent inhibitor of thiol oxidoreductase activity and stimulates reactive oxygen species production by lipoamide dehydrogenase. The Journal of biological chemistry, 277, 10064-10072. Gevorkyan, L. & Gambashidze, K. (2014). Anticancer efficacy of hydroxyethylthiamine diphosphate in vivo. Experimental oncology, 36, 48-49. Gibson, G. E., Blass, J. P., Beal, M. F. & Bunik, V. (2005). The alpha-ketoglutarate-dehydrogenase complex: a mediator between mitochondria and oxidative stress in neurodegeneration. Molecular neurobiology, 31, 43-63. Gibson, G. E., Xu, H., Chen, H. L., Chen, W., Denton, T. T. & Zhang, S. (2015). Alpha-ketoglutarate dehydrogenase complex-dependent succinylation of proteins in neurons and neuronal cell lines. Journal of neurochemistry, 134, 86-96. Goldstein, B. N., Saifullin, S. R. & Zakrzhevskaya, D. T. (1995). Principles of symmetrical organization for the pyruvate dehydrogenase complex. FEBS letters, 373, 259-261. Goldstein, B. N. & Selivanov, V. A. (1993). Unusual kinetic behavior predicted for alpha-keto acid dehydrogenase complexes. FEBS letters, 319, 267-270. Gomazkova, V. S. & Krasovskaia, O. E. (1979). [Regulation of alpha-ketoglutarate dehydrogenase complex from pigeon breast muscle]. Biokhimiia, 44, 1126-1136. Gong, X., Peng, T., Yakhnin, A., Zolkiewski, M., Quinn, J., Yeaman, S. J. & Roche, T. E. (2000). Specificity determinants for the pyruvate dehydrogenase component reaction mapped with mutated and prosthetic group modified lipoyl domains. The Journal of biological chemistry, 275, 13645-13653. Graf, A., Trofimova, L., Loshinskaja, A., Mkrtchyan, G., Strokina, A., Lovat, M., Tylicky, A., Strumilo, S., Bettendorff, L. & Bunik, V. I. (2013). Up-regulation of 2-oxoglutarate dehydrogenase as a stress response. The international journal of biochemistry & cell biology, 45, 175-189. Graham, L. D., Packman, L. C. & Perham, R. N. (1989). Kinetics and specificity of reductive acylation of lipoyl domains from 2-oxo acid dehydrogenase multienzyme complexes. Biochemistry, 28, 1574-1581. Graham, L. D. & Perham, R. N. (1990). Interactions of lipoyl domains with the E1p subunits of the pyruvate dehydrogenase multienzyme complex from Escherichia coli. FEBS letters, 262, 241-244. Green, J. D., Laue, E. D., Perham, R. N., Ali, S. T. & Guest, J. R. (1995). Three-dimensional structure of a lipoyl domain from the dihydrolipoyl acetyltransferase component of the pyruvate dehydrogenase multienzyme complex of Escherichia coli. Journal of molecular biology, 248, 328-343. Grimm, M., Calgeer, B., Teriete, P., Biegner, T., Munz, A. & Reinert, S. (2016). Targeting thiamine-dependent enzymes for metabolic therapies in oral squamous cell carcinoma? Clinical & translational oncology: official publication of the Federation of Spanish Oncology Societies and of the National Cancer Institute of Mexico, 18, 196-205. Gross, S., Cairns, R. A., Minden, M. D., Driggers, E. M., Bittinger, M. A., Jang, H. G., Sasaki, M., Jin, S., Schenkein, D. P., Su, S. M., Dang, L., Fantin, V. R. & Mak, T. W. (2010). Cancer-associated metabolite 2-hydroxyglutarate accumulates in acute myelogenous leukemia with isocitrate dehydrogenase 1 and 2 mutations. The Journal of experimental medicine, 207, 339-344. Gruys, K. J., Datta, A. & Frey, P. A. (1989). 2-Acetylthiamine pyrophosphate (acetyl-TPP) pH-rate profile for hydrolysis of acetyl-TPP and isolation of acetyl-TPP as a transient species in pyruvate dehydrogenase catalysed reactions. Biochemistry, 28, 9071-9080. Gu, Y., Zhou, Z. H., McCarthy, D. B., Reed, L. J. & Stoops, J. K. (2003). 3D electron microscopy reveals the variable deposition and protein dynamics of the peripheral pyruvate dehydrogenase component about the core. Proceedings of the National Academy of Sciences of the United States of America, 100, 7015-7020. Guest, J. R. (1987). Functional implications of structural homologies between chloramphenicol acetyltransferase and dihydrolipoamide acetyltransferase. FEMS microbiology letters, 44, 417-422. Guest, J. R., Ali, S. T., Artymiuk, P., Ford, G. C., Green, J. & Russell, G. C. (1990). Site-directed mutagenesis of dihydrolipoamide acetyltransferase and post-translational modification of its lipoyl domains. In H. Bisswanger & L. Ullrich (Eds. ), Biochemistry and physiology of thiamine diphosphate Enzymes, (pp. 176-193). Weinheim: Chemie. Guest, J. R., Angier, S. J. & Russell, G. C. (1989). Structure, expression, and protein engineering of the pyruvate dehydrogenase complex of Escherichia coli. Annals of the New York Academy of Sciences, 573, 76-99. Guest, J. R., Attwood, M. M., Machado, R. S., Matqi, K. Y., Shaw, J. E. & Turner, S. L. (1997). Enzymological and physiological consequences of restructuring the lipoyl domain content of the pyruvate dehydrogenase complex of Escherichia coli. Microbiology, 143, 457-466. Guest, J. R., Lewis, H. M., Graham, L. D., Packman, L. C. & Perham, R. N. (1985). Genetic reconstruction and functional analysis of the repeating lipoyl domains in the pyruvate dehydrogenase multienzyme complex of Escherichia coli. Journal of molecular biology, 185, 743-754. Gupta, S. C. & Dekker, E. E. (1980). Evidence for the identity and some comparative properties of alpha-ketoglutarate and 2-keto-4-hydroxyglutarate dehydrogenase activity. The Journal of biological chemistry, 255, 1107-1112. Habelhah, H., Laine, A., Erdjument-Bromage, H., Tempst, P., Gershwin, M. E., Bowtell, D. D. & Ronai, Z. (2004). Regulation of 2-oxoglutarate (alpha-ketoglutarate) dehydrogenase stability by the RING finger ubiquitin ligase Siah. The Journal of biological chemistry, 279, 53782-53788. Hackert, M. L., Oliver, R. M. & Reed, L. J. (1983). A computer model analysis of the active-site coupling mechanism in the pyruvate dehydrogenase multienzyme complex of Escherichia coli. Proceedings of the National Academy of Sciences of the United States of America, 80, 2907-2911. Hackert, M. L., Oliver, R. M. & Reed, L. J. (1983). Evidence for a multiple random coupling mechanism in the alpha-ketoglutarate dehydrogenase multienzyme complex of Escherichia coli: a computer model analysis. Proceedings of the National Academy of Sciences of the United States of America, 80, 2226-2230. Hagen, J., te Brinke, H., Wanders, R. J., Knegt, A. C., Oussoren, E., Hoogeboom, A. J., Ruijter, G. J., Becker, D., Schwab, K. O., Franke, I., Duran, M., Waterham, H. R., Sass, J. O. & Houten, S. M. (2015). Genetic basis of alpha-aminoadipic and alpha-ketoadipic aciduria. Journal of inherited metabolic disease, 38, 873-879. Haigis, M. C., Mostoslavsky, R., Haigis, K. M., Fahie, K., Christodoulou, D. C., Murphy, A. J., Valenzuela, D. M., Yancopoulos, G. D., Karow, M., Blander, G., Wolberger, C., Prolla, T. A., Weindruch, R., Alt, F. W. & Guarente, L. (2006). SIRT4 inhibits glutamate dehydrogenase and opposes the effects of calorie restriction in pancreatic beta cells. Cell, 126, 941-954. Hale, G. & Perham, R. N. (1979). Polypeptide-chain stoicheiometry and lipoic acid content of the pyruvate dehydrogenase complex of Escherichia coli. The Biochemical journal, 177, 129-136. Hale, G., Wallis, N. G. & Perham, R. N. (1992). Interaction of avidin with the lipoyl domains in the pyruvate dehydrogenase multienzyme complex: three-dimensional location and similarity to biotinyl domains in carboxylases. Proceedings Biological sciences/The Royal Society, 248, 247-253. Han, C., Yang, L., Choi, H. H., Baddour, J., Achreja, A., Liu, Y., Li, Y., Li, J., Wan, G., Huang, C., Ji, G., Zhang, X., Nagrath, D. & Lu, X. (2016). Amplification of USP13 drives ovarian cancer metabolism. Nature communications, 7, 13525. Hanberry, B. S., Berger, R. & Zastre, J. A. (2014). High-dose vitamin B1 reduces proliferation in cancer cell lines analogous to dichloroacetate. Cancer chemotherapy and pharmacology, 73, 585-594. Hanemaaijer, R., de Kok, A., Jolles, J. & Veeger, C. (1987). The domain structure of the dihydrolipoyl transacetylase component of the pyruvate dehydrogenase complex from Azotobacter vinelandii. European journal of biochemistry/FEBS, 169, 245-252. Harris, R. A., Bowker-Kinley, M. M., Huang, B. & Wu, P. (2002). Regulation of the activity of the pyruvate dehydrogenase complex. Advances in enzyme regulation, 42, 249-259. Harris, R. A., Bowker-Kinley, M. M., Wu, P., Jeng, J. & Popov, K. M. (1997). Dihydrolipoamide dehydrogenase-binding protein of the human pyruvate dehydrogenase complex. DNA-derived amino acid sequence, expression, and reconstitution of the pyruvate dehydrogenase complex. The Journal of biological chemistry, 272, 19746-19751. Harris, R. A., Joshi, M., Jeoung, N. H. & Obayashi, M. (2005). Overview of the molecular and biochemical basis of branched-chain amino acid catabolism. The Journal of nutrition, 135, 1527S-1530S. Harris, R. A., Kobayashi, R., Murakami, T. & Shimomura, Y. (2001). Regulation of branched-chain alpha-keto acid dehydrogenase kinase expression in rat liver. The Journal of nutrition, 131, 841S-845S. Harting, I., Boy, N., Heringer, J., Seitz, A., Bendszus, M., Pouwels, P. J. & Kolker, S. (2015). (1)H-MRS in glutaric aciduria type 1: impact of biochemical phenotype and age on the cerebral accumulation of neurotoxic metabolites. Journal of inherited metabolic disease, 38, 829-838. Hawkins, C. F., Borges, A. & Perham, R. N. (1989). A common structural motif in thiamine pyrophosphate-binding enzymes. FEBS letters, 255, 77-82. He, H. W., Peng, H. & Tan, X. S. (2014). in Environmentally friendly alkylphosphonate herbicides, Chemical industry press, Beijing. Heath, C., Jeffries, A. C., Hough, D. W. & Danson, M. J. (2004). Discovery of the catalytic function of a putative 2-oxoacid dehydrogenase multienzyme complex in the thermophilic archaeon Thermoplasma acidophilum. FEBS letters, 577, 523-527. Heath, C., Posner, M. G., Aass, H. C., Upadhyay, A., Scott, D. J., Hough, D. W. & Danson, M. J. (2007). The 2-oxoacid dehydrogenase multi-enzyme complex of the archaeon Thermoplasma acidophilum - recombinant expression, assembly and characterization. The FEBS journal, 274, 5406-5415. Hein, S. & Steinbuchel, A. (1994). Biochemical and molecular characterization of the Alcaligenes eutrophus pyruvate dehydrogenase complex and identification of a new type of dihydrolipoamide dehydrogenase. Journal of bacteriology, 176, 4394-4408. Henderson, C. E., Perham, R. N. & Finch, J. T. (1979). Structure and symmetry of B. stearothermophilus pyruvate dehydrogenase multienzyme complex and implications for eucaryote evolution. Cell, 17, 85-93. Hendle, J., Mattevi, A., Westphal, A. H., Spee, J., de Kok, A., Teplyakov, A. & Hol, W. G. (1995). Crystallographic and enzymatic investigations on the role of Ser558, His610, and Asn614 in the catalytic mechanism of Azotobacter vinelandii dihydrolipoamide acetyltransferase (E2p). Biochemistry, 34, 4287-4298. Hengeveld, A. F., Schoustra, S. E., Westphal, A. H. & de Kok, A. (1999). Pyruvate dehydrogenase from Azotobacter vinelandii. Properties of the N-terminally truncated enzyme. European journal of biochemistry/FEBS, 265, 1098-1107. Hipps, D. S., Packman, L. C., Allen, M. D., Fuller, C., Sakaguchi, K., Appella, E. & Perham, R. N. (1994). The peripheral subunit-binding domain of the dihydrolipoyl acetyltransferase component of the pyruvate dehydrogenase complex of Bacillus stearothermophilus: preparation and characterization of its binding to the dihydrolipoyl dehydrogenase component. The Biochemical journal, 297, 137-143. Hipps, D. S. & Perham, R. N. (1992). Expression in Escherichia coli of a sub-gene encoding the lipoyl and peripheral subunit-binding domains of the dihydrolipoamide acetyltransferase component of the pyruvate dehydrogenase complex of Bacillus stearothermophilus. The Biochemical journal, 283, 665-671. Hiromasa, Y., Hu, L. & Roche, T. E. (2006). Ligand-induced effects on pyruvate dehydrogenase kinase isoform 2. The Journal of biological chemistry, 281, 12568-12579. Hiromasa, Y. & Roche, T. E. (2008). Critical role of specific ions for ligand-induced changes regulating pyruvate dehydrogenase kinase isoform 2. Biochemistry, 47, 2298-2311. Hiromasa, Y., Yan, X. & Roche, T. E. (2008). Specific ion influences on self-association of pyruvate dehydrogenase kinase isoform 2 (PDHK2), binding of PDHK2 to the L2 lipoyl domain, and effects of the lipoyl group-binding site inhibitor, Nov3r. Biochemistry, 47, 2312-2324. Hirschey, M. D. & Zhao, Y. (2015). Metabolic Regulation by Lysine Malonylation, Succinylation, and Glutarylation. Molecular & cellular proteomics, 14, 2308-2315. Hitosugi, T., Fan, J., Chung, T. W., Lythgoe, K., Wang, X., Xie, J., Ge, Q., Gu, T. L., Polakiewicz, R. D., Roesel, J. L., Chen, G. Z., Boggon, T. J., Lonial, S., Fu, H., Khuri, F. R., Kang, S. & Chen, J. (2011). Tyrosine phosphorylation of mitochondrial pyruvate dehydrogenase kinase 1 is important for cancer metabolism. Molecular cell, 44, 864-877. Holmgren, A. (1979). Thioredoxin catalyses the reduction of insulin disulfides by dithiothreitol and dihydrolipoamide. The Journal of biological chemistry, 254, 9627-9632. Hoque, M. O., Kim, M. S., Ostrow, K. L., Liu, J., Wisman, G. B., Park, H. L., Poeta, M. L., Jeronimo, C., Henrique, R., Lendvai, A., Schuuring, E., Begum, S., Rosenbaum, E., Ongenaert, M., Yamashita, K., Califano, J., Westra, W., van der Zee, A. G., Van Criekinge, W. & Sidransky, D. (2008). Genome-wide promoter analysis uncovers portions of the cancer methylome. Cancer research, 68, 2661-2670. Hoshi, M., Takashima, A., Noguchi, K., Murayama, M., Sato, M., Kondo, S., Saitoh, Y., Ishiguro, K., Hoshino, T. & Imahori, K. (1996). Regulation of mitochondrial pyruvate dehydrogenase activity by tau protein kinase I/glycogen synthase kinase 3beta in brain. Proceedings of the National Academy of Sciences of the United States of America, 93, 2719-2723. Huang, B., Gudi, R., Wu, P., Harris, R. A., Hamilton, J. & Popov, K. M. (1998). Isoenzymes of pyruvate dehydrogenase phosphatase. DNA-derived amino acid sequences, expression, and regulation. The Journal of biological chemistry, 273, 17680-17688. Huang, B., Wu, P., Popov, K. M. & Harris, R. A. (2003). Starvation and diabetes reduce the amount of pyruvate dehydrogenase phosphatase in rat heart and kidney. Diabetes, 52, 1371-1376. Hucho, F., Randall, D. D., Roche, T. E., Burgett, M. W., Pelley, J. W. & Reed, L. J. (1972). -Keto acid dehydrogenase complexes. XVII. Kinetic and regulatory properties of pyruvate dehydrogenase kinase and pyruvate dehydrogenase phosphatase from bovine kidney and heart. Archives of biochemistry and biophysics, 151, 328-340. Huebner, G., Neef, H. & Schellenberger, A. (1978). Two-center mechanism for the oxidative decarboxylation of pyruvate by the pyruvate decarboxylating component of the pyruvate dehydrogenase complex of pigeon breast muscle. FEBS letters, 86, 6-8. Ishikawa, E., Oliver, R. M. & Reed, L. J. (1966). Alpha-Keto acid dehydrogenase complexes, V. Macromolecular organization of pyruvate and alpha-ketoglutarate dehydrogenase complexes isolated from beef kidney mitochondria. Proceedings of the National Academy of Sciences of the United States of America, 56, 534-541. Izard, T., Aevarsson, A., Allen, M. D., Westphal, A. H., Perham, R. N., de Kok, A. & Hol, W. G. (1999). Principles of quasi-equivalence and Euclidean geometry govern the assembly of cubic and dodecahedral cores of pyruvate dehydrogenase complexes. Proceedings of the National Academy of Sciences of the United States of America, 96, 1240-1245. Izard, T., Sarfaty, S., Westphal, A., de Kok, A. & Hol, W. G. (1997). Improvement of diffraction quality upon rehydration of dehydrated icosahedral Enterococcus faecalis pyruvate dehydrogenase core crystals. Protein science: a publication of the Protein Society, 6, 913-915. Jackson, R. H. & Singer, T. P. (1983). Inactivation of the 2-ketoglutarate and pyruvate dehydrogenase complexes of beef heart by branched-chain keto acids. The Journal of biological chemistry, 258, 1857-1865. Jankowska-Kulawy, A., Bielarczyk, H., Pawelczyk, T., Wroblewska, M. & Szutowicz, A. (2010). Acetyl-CoA and acetylcholine metabolism in nerve terminal compartment of thiamine deficient rat brain. Journal of neurochemistry, 115, 333-342. Jeoung, N. H. (2015). Pyruvate Dehydrogenase Kinases: Therapeutic Targets for Diabetes and Cancers. Diabetes & metabolism journal, 39, 188-197. Jeoung, N. H., Harris, C. R. & Harris, R. A. (2014). Regulation of pyruvate metabolism in metabolic-related diseases. Reviews in endocrine & metabolic disorders, 15, 99-110. Jilka, J. M., Rahmatullah, M., Kazemi, M. & Roche, T. E. (1986). Properties of a newly characterized protein of the bovine kidney pyruvate dehydrogenase complex. The Journal of biological chemistry, 261, 1858-1867. Jones, D. D., Horne, H. J., Reche, P. A. & Perham, R. N. (2000a). Structural determinants of post-translational modification and catalytic specificity for the lipoyl domains of the pyruvate dehydrogenase multienzyme complex of Escherichia coli. Journal of molecular biology, 295, 289-306. Jones, D. D., Stott, K. M., Howard, M. J. & Perham, R. N. (2000b). Restricted motion of the lipoyl-lysine swinging arm in the pyruvate dehydrogenase complex of Escherichia coli. Biochemistry, 39, 8448-8459. Jordan, F. (1999). Interplay of organic and biological chemistry in understanding coenzyme mechanisms: example of thiamine diphosphate-dependent decarboxylations of 2-oxo acids. FEBS letters, 457, 298-301. Jordan, F. (2004). Biochemistry. How active sites communicate in thiamine enzymes. Science, 306, 818-820. Jordan, F. (2010). Thiamine Enzymology. In L. L. Mander & H.-W. Liu (Eds. ), Comprehensive natural products II: chemistry and biology, (pp. 561-598). Elsevier Science. Jordan, F. & Mariam, Y. H. (1978). N1’-Methylthiaminium diiodide. Model study on the effect of a coenzyme bound positive charge on reaction mechanisms requiring thiamine pyrophosphate. Journal of the American Chemical Society, 100, 2534-2541. Jordan, F. & Nemeria, N. S. (2014). Progress in the experimental observation of thiamine diphosphate-bound intermediates on enzymes and mechanistic information derived from these observations. Bioorganic chemistry, 57, 251-262. Joshi, M., Jeoung, N. H., Popov, K. M. & Harris, R. A. (2007). Identification of a novel PP2C-type mitochondrial phosphatase. Biochemical and biophysical research communications, 356, 38-44. Judge, S. J., Savy, C. Y., Campbell, M., Dodds, R., Gomes, L. K., Laws, G., Watson, A., Blain, P. G., Morris, C. M. & Gartside, S. E. (2016). Mechanism for the acute effects of organophosphate pesticides on the adult 5-HT system. Chemico-biological interactions, 245, 82-89. Kabysheva, M. S., Storozhevykh, T. P., Pinelis, V. G. & Bunik, V. I. (2009). Synthetic regulators of the 2-oxoglutarate oxidative decarboxylation alleviate the glutamate excitotoxicity in cerebellar granule neurons. Biochemical pharmacology, 77, 1531-1540. Kadota, Y., Toyoda, T., Hayashi-Kato, M., Kitaura, Y. & Shimomura, Y. (2015). Octanoic acid promotes branched-chain amino acid catabolisms via the inhibition of hepatic branched-chain alpha-keto acid dehydrogenase kinase in rats. Metabolism: clinical and experimental, 64, 1157-1164. Kalia, Y. N., Brocklehurst, S. M., Hipps, D. S., Appella, E., Sakaguchi, K. & Perham, R. N. (1993). The high-resolution structure of the peripheral subunit-binding domain of dihydrolipoamide acetyltransferase from the pyruvate dehydrogenase multienzyme complex of Bacillus stearothermophilus. Journal of molecular biology, 230, 323-341. Kaplun, A., Binshtein, E., Vyazmensky, M., Steinmetz, A., Barak, Z., Chipman, D. M., Tittmann, K. & Shaanan, B. (2008). Glyoxylate carboligase lacks the canonical active site glutamate of thiamine-dependent enzymes. Nature chemical biology, 4, 113-118. Karlson, P. (1984). The structure of vitamin B1. Trends in Biochemical Sciences, 9, 536-537. Karpova, T., Danchuk, S., Kolobova, E. & Popov, K. M. (2003). Characterization of the isozymes of pyruvate dehydrogenase phosphatase: implications for the regulation of pyruvate dehydrogenase activity. Biochimica et biophysica acta, 1652, 126-135. Kato, M., Li, J., Chuang, J. L. & Chuang, D. T. (2007). Distinct structural mechanisms for inhibition of pyruvate dehydrogenase kinase isoforms by AZD7545, dichloroacetate, and radicicol. Structure, 15, 992-1004. Kato, M., Wynn, R. M., Chuang, J. L., Brautigam, C. A., Custorio, M. & Chuang, D. T. (2006). A synchronized substrate-gating mechanism revealed by cubic-core structure of the bovine branched-chain alpha-ketoacid dehydrogenase complex. The EMBO journal, 25, 5983-5994. Kato, M., Wynn, R. M., Chuang, J. L., Tso, S. C., Machius, M., Li, J. & Chuang, D. T. (2008). Structural basis for inactivation of the human pyruvate dehydrogenase complex by phosphorylation: role of disordered phosphorylation loops. Structure, 16, 1849-1859. Katsube, T., Nomoto, S., Togashi, S., Ueda, R., Kobayashi, M. & Takahisa, M. (1997). cDNA sequence and expression of a gene encoding a pyruvate dehydrogenase kinase homolog of Drosophila melanogaster. DNA and cell biology, 16, 335-339. Kawaguchi, K., Senga, S., Kubota, C., Kawamura, Y., Ke, Y. & Fujii, H. (2016). High expression of Fatty Acid-Binding Protein 5 promotes cell growth and metastatic potential of colorectal cancer cells. FEBS open bio, 6, 190-199. Keibler, M. A., Fendt, S. M. & Stephanopoulos, G. (2012). Expanding the concepts and tools of metabolic engineering to elucidate cancer metabolism. Biotechnology progress, 28, 1409-1418. Kennerson, M. L., Yiu, E. M., Chuang, D. T., Kidambi, A., Tso, S. C., Ly, C., Chaudhry, R., Drew, A. P., Rance, G., Delatycki, M. B., Zuchner, S., Ryan, M. M. & Nicholson, G. A. (2013). A new locus for X-linked dominant Charcot-Marie-Tooth disease (CMTX6) is caused by mutations in the pyruvate dehydrogenase kinase isoenzyme 3 (PDK3) gene. Human molecular genetics, 22, 1404-1416. Kerbey, A. L., Radcliffe, P. M., Randle, P. J. & Sugden, P. H. (1979). Regulation of kinase reactions in pig heart pyruvate dehydrogenase complex. The Biochemical journal, 181, 427-433. Kerbey, A. L., Randle, P. J. & Kearns, A. (1981). Dephosphorylation of pig heart pyruvate dehydrogenase phosphate complexes by pig heart pyruvate dehydrogenase phosphate phosphatase. The Biochemical journal, 195, 51-59. Kern, D., Kern, G., Neef, H., Killenberg-Jabs, M., Tittman, K. & Huebner, G. (1996). How thiamine diphosphate is activated in enzymes. In H. Bisswanger & A. Schellenberger (Eds. ), Biochemistry and physiology of thiamine diphosphate enzymes, (pp. 25-32). Prien: A.u.C. Intemann. Khailova, L. S., Alexandrovitch, O. V. & Severin, S. E. (1985). Substrate-dependent inactivation of muscle pyruvate dehydrogenase: identification of the acetyl-substituted enzyme form. Biochemistry international, 10, 291-300. Khailova, L. S., Korochkina, L. G. & Severin, S. E. (1989). Organization and functioning of muscle pyruvate dehydrogenase active centers. Annals of the New York Academy of Sciences, 573, 36-54. Khailova, L. S., Nemerya, N. S. & Severin, S. E. (1983). The substrate-mediated inactivation of the pyruvate dehydrogenase component of the pigeon breast muscle pyruvate dehydrogenase complex. Biochemistry international, 7, 423-432. Killenberg-Jabs, M., Konig, S., Eberhardt, I., Hohmann, S. & Hubner, G. (1997). Role of Glu51 for cofactor binding and catalytic activity in pyruvate decarboxylase from yeast studied by site-directed mutagenesis. Biochemistry, 36, 1900-1905. Kim, J. W., Tchernyshyov, I., Semenza, G. L. & Dang, C. V. (2006). HIF-1-mediated expression of pyruvate dehydrogenase kinase: a metabolic switch required for cellular adaptation to hypoxia. Cell metabolism, 3, 177-185. Kim, S., Shin, E. J., Hahm, J. H., Park, P. J., Hwang, J. E. & Paik, Y. K., (2012). PDHK-2 deficiency is associated with attenuation of lipase-mediated fat consumption for the increased survival of Caenorhabditis elegans dauers. PloS one, 7, e41755. Kleemann, R., Mischke, R., Kapurniotu, A., Brunner, H. & Bernhagen, J. (1998). Specific reduction of insulin disulfides by macrophage migration inhibitory factor (MIF) with glutathione and dihydrolipoamide: potential role in cellular redox processes. FEBS letters, 430, 191-196. Knapp, J. E., Mitchell, D. T., Yazdi, M. A., Ernst, S. R., Reed, L. J. & Hackert, M. L. (1998). Crystal structure of the truncated cubic core component of the Escherichia coli 2-oxoglutarate dehydrogenase multienzyme complex. Journal of molecular biology, 280, 655-668. Kobayashi, R., Shimomura, Y., Murakami, T., Nakai, N., Fujitsuka, N., Otsuka, M., Arakawa, N., Popov, K. M. & Harris, R. A. (1997). Gender difference in regulation of branched-chain amino acid catabolism. The Biochemical journal, 327, 449-453. Koike, K. (1998). Cloning, structure, chromosomal localization and promoter analysis of human 2-oxoglutarate dehydrogenase gene. Biochimica et biophysica acta, 1385, 373-384. Koike, M., Reed, L. J. & Carroll, W. R. (1963). alpha-Keto acid dehydrogenation complexes. IV. Resolution and reconstitution of the Escherichia coli pyruvate dehydrogenation complex. The Journal of biological chemistry, 238, 30-39. Kolobova, E., Tuganova, A., Boulatnikov, I. & Popov, K. M. (2001). Regulation of pyruvate dehydrogenase activity through phosphorylation at multiple sites. The Biochemical journal, 358, 69-77. Kong, Y., Ming, D., Wu, Y., Stoops, J. K., Zhou, Z. H. & Ma, J. (2003). Conformational flexibility of pyruvate dehydrogenase complexes: a computational analysis by quantized elastic deformational model. Journal of molecular biology, 330, 129-135. Korotchkina, L. G., Khailova, L. S. & Severin, S. E. (1995). The effect of phosphorylation on pyruvate dehydrogenase. FEBS letters, 364, 185-188. Korotchkina, L. G. & Patel, M. S. (2001a). Probing the mechanism of inactivation of human pyruvate dehydrogenase by phosphorylation of three sites. The Journal of biological chemistry, 276, 5731-5738. Korotchkina, L. G. & Patel, M. S. (2001b). Site specificity of four pyruvate dehydrogenase kinase isoenzymes toward the three phosphorylation sites of human pyruvate dehydrogenase. The Journal of biological chemistry, 276, 37223-37229. Korotchkina, L. G., Sidhu, S. & Patel, M. S. (2004). R-lipoic acid inhibits mammalian pyruvate dehydrogenase kinase. Free radical research, 38, 1083-1092. Kruger, N., Oppermann, F. B., Lorenzl, H. & Steinbuchel, A. (1994). Biochemical and molecular characterization of the Clostridium magnum acetoin dehydrogenase enzyme system. Journal of bacteriology, 176, 3614-3630. Ksiezak-Reding, H., Peterson, C. & Gibson, G. E. (1984). The pyruvate dehydrogenase complex during aging. Mechanisms of ageing and development, 26, 67-73. Kulkarni, S. S., Salehzadeh, F., Fritz, T., Zierath, J. R., Krook, A. & Osler, M. E. (2012). Mitochondrial regulators of fatty acid metabolism reflect metabolic dysfunction in type 2 diabetes mellitus. Metabolism: clinical and experimental, 61, 175-185. Kumaran, S., Patel, M. S. & Jordan, F. (2013). Nuclear magnetic resonance approaches in the study of 2-oxo acid dehydrogenase multienzyme complexes--a literature review. Molecules, 18, 11873-11903. Kunze, M., Pracharoenwattana, I., Smith, S. M. & Hartig, A. (2006). A central role for the peroxisomal membrane in glyoxylate cycle function. Biochimica et biophysica acta, 1763, 1441-1452. Laurent, G., German, N. J., Saha, A. K., de Boer, V. C., Davies, M., Koves, T. R., Dephoure, N., Fischer, F., Boanca, G., Vaitheesvaran, B., Lovitch, S. B., Sharpe, A. H., Kurland, I. J., Steegborn, C., Gygi, S. P., Muoio, D. M., Ruderman, N. B. & Haigis, M. C. (2013). SIRT4 coordinates the balance between lipid synthesis and catabolism by repressing malonyl CoA decarboxylase. Molecular cell, 50, 686-698. Lawlis, V. B. & Roche, T. E. (1981a). Inhibition of bovine kidney alpha-ketoglutarate dehydrogenase complex by reduced nicotinamide adenine dinucleotide in the presence or absence of calcium ion and effect of adenosine 5’-diphosphate on reduced nicotinamide adenine dinucleotide inhibition. Biochemistry, 20, 2519-2524. Lawlis, V. B. & Roche, T. E. (1981b). Regulation of bovine kidney alpha-ketoglutarate dehydrogenase complex by calcium ion and adenine nucleotides. Effects on S0.5 for alpha-ketoglutarate. Biochemistry, 20, 2512-2518. Lawson, J. E., Behal, R. H. & Reed, L. J. (1991a). Disruption and mutagenesis of the Saccharomyces cerevisiae PDX1 gene encoding the protein X component of the pyruvate dehydrogenase complex. Biochemistry, 30, 2834-2839. Lawson, J. E., Niu, X. D. & Reed, L. J. (1991b). Functional analysis of the domains of dihydrolipoamide acetyltransferase from Saccharomyces cerevisiae. Biochemistry, 30, 11249-11254. Lawson, J. E., Park, S. H., Mattison, A. R., Yan, J. & Reed, L. J. (1997). Cloning, expression, and properties of the regulatory subunit of bovine pyruvate dehydrogenase phosphatase. The Journal of biological chemistry, 272, 31625-31629. Lee, I. K. (2014). The role of pyruvate dehydrogenase kinase in diabetes and obesity. Diabetes & metabolism journal, 38, 181-186. Lefresne, P., Hamon, M., Beaujouan, J. C. & Glowinski, J. (1977). Origin of the acetyl moiety of acetylcholine synthesized in rat striatal synaptosomes. Biochimie, 59, 197-215. Lengyel, J. S., Stott, K. M., Wu, X., Brooks, B. R., Balbo, A., Schuck, P., Perham, R. N., Subramaniam, S. & Milne, J. L. (2008). Extended polypeptide linkers establish the spatial architecture of a pyruvate dehydrogenase multienzyme complex. Structure, 16, 93-103. Leskovac, V., Svircevic, J., Trivic, S., Popovic, M. & Radulovic, M. (1989). Reduction of aryl-nitroso compounds by pyridine and flavin coenzymes. The International journal of biochemistry, 21, 825-834. Lessard, I. A. & Perham, R. N. (1995). Interaction of component enzymes with the peripheral subunit-binding domain of the pyruvate dehydrogenase multienzyme complex of Bacillus stearothermophilus: stoichiometry and specificity in self-assembly. The Biochemical journal, 306, 727-733. Letzien, U., Oppermann, H., Meixensberger, J. & Gaunitz, F. (2014). The antineoplastic effect of carnosine is accompanied by induction of PDK4 and can be mimicked by L-histidine. Amino acids, 46, 1009-1019. Li de la Sierra, I., Pernot, L., Prange, T., Saludjian, P., Schiltz, M., Fourme, R. & Padron, G. (1997). Molecular structure of the lipoamide dehydrogenase domain of a surface antigen from Neisseria meningitidis. Journal of molecular biology, 269, 129-141. Li de la Sierra, I., Prange, T., Fourme, R., Padron, G., Fuentes, P., Musacchio, A. & Madrazo, J. (1994). Crystallization and preliminary X-ray investigation of a recombinant outer membrane protein from Neisseria meningitidis. Journal of molecular biology, 235, 1154-1155. Li, J., Wynn, R. M., Machius, M., Chuang, J. L., Karthikeyan, S., Tomchick, D. R. & Chuang, D. T. (2004). Cross-talk between thiamine diphosphate binding and phosphorylation loop conformation in human branched-chain alpha-keto acid decarboxylase/dehydrogenase. The Journal of biological chemistry, 279, 32968-32978. Li, R., Luo, X., Wu, J., Thangthaeng, N., Jung, M. E., Jing, S., Li, L., Ellis, D. Z., Liu, L., Ding, Z., Forster, M. J. & Yan, L. J. (2015). Mitochondrial Dihydrolipoamide Dehydrogenase is Upregulated in Response to Intermittent Hypoxic Preconditioning. International journal of medical sciences, 12, 432-440. Lin, H., Su, X. & He, B. (2012). Protein lysine acylation and cysteine succination by intermediates of energy metabolism. ACS chemical biology, 7, 947-960. Lindsay, J. G. (1989). Targeting of 2-oxo acid dehydrogenase complexes to the mitochondrion. Annals of the New York Academy of Sciences, 573, 254-266. Linn, T. C., Pettit, F. H. & Reed, L. J. (1969). Alpha-keto acid dehydrogenase complexes. X. Regulation of the activity of the pyruvate dehydrogenase complex from beef kidney mitochondria by phosphorylation and dephosphorylation. Proceedings of the National Academy of Sciences of the United States of America, 62, 234-241. Liskiewicz, A. D., Kasprowska, D., Wojakowska, A., Polanski, K., Lewin-Kowalik, J., Kotulska, K. & Jedrzejowska-Szypulka, H. (2016). Long-term High Fat Ketogenic Diet Promotes Renal Tumor Growth in a Rat Model of Tuberous Sclerosis. Scientific reports, 6, 21807. Liu, S., Baker, J. C. & Roche, T. E. (1995). Binding of the pyruvate dehydrogenase kinase to recombinant constructs containing the inner lipoyl domain of the dihydrolipoyl acetyltransferase component. The Journal of biological chemistry, 270, 793-800. Liu, S., Monks, N. R., Hanes, J. W., Begley, T. P., Yu, H. & Moscow, J. A. (2010). Sensitivity of breast cancer cell lines to recombinant thiaminase I. Cancer chemotherapy and pharmacology, 66, 171-179. Lmoumene, C. E., Conte, D., Jacquot, J. P. & Houee-Levin, C. (2000). Redox properties of protein disulfide bond in oxidized thioredoxin and lysozyme: a pulse radiolysis study. Biochemistry, 39, 9295-9301. Lowe, P. N., Hodgson, J. A. & Perham, R. N. (1983). Dual role of a single multienzyme complex in the oxidative decarboxylation of pyruvate and branched-chain 2-oxo acids in Bacillus subtilis. The Biochemical journal, 215, 133-140. Lu, G., Sun, H., She, P., Youn, J. Y., Warburton, S., Ping, P., Vondriska, T. M., Cai, H., Lynch, C. J. & Wang, Y. (2009). Protein phosphatase 2Cm is a critical regulator of branched-chain amino acid catabolism in mice and cultured cells. The Journal of clinical investigation, 119, 1678-1687. Lu, J., Chew, E. H. & Holmgren, A. (2007). Targeting thioredoxin reductase is a basis for cancer therapy by arsenic trioxide. Proceedings of the National Academy of Sciences of the United States of America, 104, 12288-12293. Lutziger, I. & Oliver, D. J. (2000). Molecular evidence of a unique lipoamide dehydrogenase in plastids: analysis of plastidic lipoamide dehydrogenase from Arabidopsis thaliana. FEBS letters, 484, 12-16. Machius, M., Wynn, R. M., Chuang, J. L., Li, J., Kluger, R., Yu, D., Tomchick, D. R., Brautigam, C. A. & Chuang, D. T. (2006). A versatile conformational switch regulates reactivity in human branched-chain alpha-ketoacid dehydrogenase. Structure, 14, 287-298. Maeda-Yorita, K., Russell, G. C., Guest, J. R., Massey, V. & Williams, C. H. Jr. (1994). Modulation of the oxidation-reduction potential of the flavin in lipoamide dehydrogenase from Escherichia coli by alteration of a nearby charged residue, K53R. Biochemistry, 33, 6213-6220. Maeng, C. Y., Yazdi, M. A., Niu, X. D., Lee, H. Y. & Reed, L. J. (1994). Expression, purification, and characterization of the dihydrolipoamide dehydrogenase-binding protein of the pyruvate dehydrogenase complex from Saccharomyces cerevisiae. Biochemistry, 33, 13801-13807. Mande, S. S., Sarfaty, S., Allen, M. D., Perham, R. N. & Hol, W. G. (1996). Protein-protein interactions in the pyruvate dehydrogenase multienzyme complex: dihydrolipoamide dehydrogenase complexed with the binding domain of dihydrolipoamide acetyltransferase. Structure, 4, 277-286. Marin-Valencia, I., Yang, C., Mashimo, T., Cho, S., Baek, H., Yang, X. L., Rajagopalan, K. N., Maddie, M., Vemireddy, V., Zhao, Z., Cai, L., Good, L., Tu, B. P., Hatanpaa, K. J., Mickey, B. E., Mates, J. M., Pascual, J. M., Maher, E. A., Malloy, C. R., Deberardinis, R. J. & Bachoo, R. M. (2012). Analysis of tumor metabolism reveals mitochondrial glucose oxidation in genetically diverse human glioblastomas in the mouse brain in vivo. Cell metabolism, 15, 827-837. Markiewicz, J. & Strumilo, S. (1997). The effect of Mn2+ on the catalytic function of heart muscle 2-oxoglutarate dehydrogenase complex. Biochemical Archives, 13, 127-129. Markiewicz, J. & Strumilo, S. A. (1995). Some regulatory properties of the 2-oxoglutarate dehydrogenase complex from European bison heart. Acta biochimica Polonica, 42, 339-346. Marrott, N. L., Marshall, J. J., Svergun, D. I., Crennell, S. J., Hough, D. W., Danson, M. J. & van den Elsen, J. M. (2012). The catalytic core of an archaeal 2-oxoacid dehydrogenase multienzyme complex is a 42-mer protein assembly. The FEBS journal, 279, 713-723. Marrott, N. L., Marshall, J. J., Svergun, D. I., Crennell, S. J., Hough, D. W., van den Elsen, J. M. & Danson, M. J. (2014). 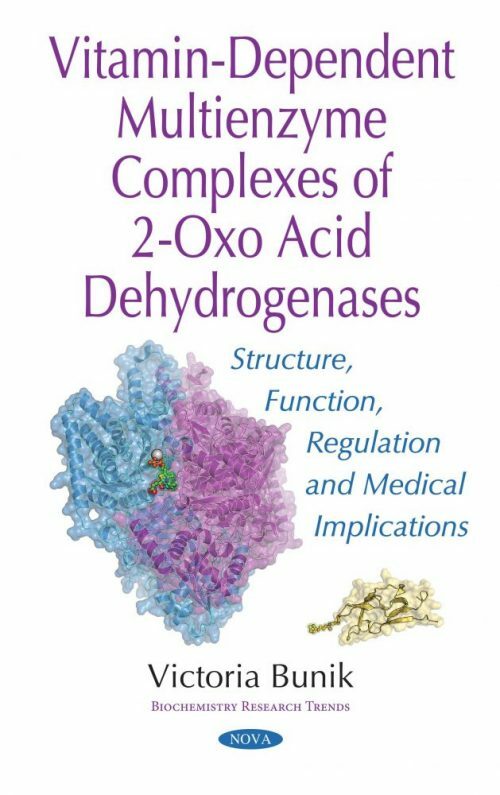 Why are the 2-oxoacid dehydrogenase complexes so large? Generation of an active trimeric complex. The Biochemical journal, 463, 405-412. Massey, V. (1963). Lipoyl dehydrogenase. The Enzymes, 7, 275-306. Massey, V., Gibson, Q. H. & Veeger, C. (1960). Intermediates in the catalytic action of lipoyl dehydrogenase (diaphorase). The Biochemical journal, 77, 341-351. Massey, V., Muller, F., Feldberg, R., Schuman, M., Sullivan, P. A., Howell, L. G., Mayhew, S. G., Matthews, R. G. & Foust, G. P. (1969a). The reactivity of flavoproteins with sulfite. Possible relevance to the problem of oxygen reactivity. The Journal of biological chemistry, 244, 3999-4006. Massey, V., Strickland, S., Mayhew, S. G., Howell, L. G., Engel, P. C., Matthews, R. G., Schuman, M. & Sullivan, P. A. (1969b). The production of superoxide anion radicals in the reaction of reduced flavins and flavoproteins with molecular oxygen. Biochemical and biophysical research communications, 36, 891-897. Mathias, R. A., Greco, T. M., Oberstein, A., Budayeva, H. G., Chakrabarti, R., Rowland, E. A., Kang, Y., Shenk, T. & Cristea, I. M. (2014). Sirtuin 4 is a lipoamidase regulating pyruvate dehydrogenase complex activity. Cell, 159, 1615-1625. Mattevi, A., Obmolova, G., Kalk, K. H., Teplyakov, A. & Hol, W. G., 1993a. Crystallographic analysis of substrate binding and catalysis in dihydrolipoyl transacetylase (E2p). Biochemistry, 32, 3887-3901. Mattevi, A., Obmolova, G., Kalk, K. H., van Berkel, W. J. & Hol, W. G. (1993b). Three-dimensional structure of lipoamide dehydrogenase from Pseudomonas fluorescens at 2.8 A resolution. Analysis of redox and thermostability properties. Journal of molecular biology, 230, 1200-1215. Mattevi, A., Obmolova, G., Schulze, E., Kalk, K. H., Westphal, A. H., de Kok, A. & Hol, W. G. (1992a). Atomic structure of the cubic core of the pyruvate dehydrogenase multienzyme complex. Science, 255, 1544-1550. Mattevi, A., Obmolova, G., Sokatch, J. R., Betzel, C. & Hol, W. G. (1992b). The refined crystal structure of Pseudomonas putida lipoamide dehydrogenase complexed with NAD+ at 2.45 A resolution. Proteins, 13, 336-351. Mattevi, A., Schierbeek, A. J. & Hol, W. G. (1991). Refined crystal structure of lipoamide dehydrogenase from Azotobacter vinelandii at 2.2 A resolution. A comparison with the structure of glutathione reductase. Journal of molecular biology, 220, 975-994. Matthews, R. G., Ballou, D. P., Thorpe, C. & Williams, C. H. Jr. (1977). Ion pair formation in pig heart lipoamide dehydrogenase: rationalization of pH profiles for reactivity of oxidized enzyme with dihydrolipoamide and 2-electron-reduced enzyme with lipoamide and iodoacetamide. The Journal of biological chemistry, 252, 3199-3207. Matthews, R. G. & Williams, C. H. Jr. (1976). Measurement of the oxidation-reduction potentials for two-electron and four-electron reduction of lipoamide dehydrogenase from pig heart. The Journal of biological chemistry, 251, 3956-3964. Matuda, S., Arimura, T., Kimura, A., Takekura, H., Ohta, S. & Nakano, K. (2010). A novel protein found in the I bands of myofibrils is produced by alternative splicing of the DLST gene. Biochimica et biophysica acta, 1800, 31-39. Matuda, S., Kodama, J., Goshi, N., Takase, C., Nakano, K., Nakagawa, S. & Ohta, S. (1997). A polypeptide derived from mitochondrial dihydrolipoamide succinyltransferase is located on the plasma membrane in skeletal muscle. Biochemical and biophysical research communications, 241, 151-156. Matuda, S. & Obo, F. (1979). Hg2+-stimulated NADH-oxidase activity of Ascaris muscle microsomal lipoamide dehydrogenase. Biochemical and biophysical research communications, 91, 835-841. Maurer, C. M., Schonthaler, H. B., Mueller, K. P. & Neuhauss, S. C. (2010). Distinct retinal deficits in a zebrafish pyruvate dehydrogenase-deficient mutant. The Journal of neuroscience: the official journal of the Society for Neuroscience, 30, 11962-11972. McCartney, R. G., Rice, J. E., Sanderson, S. J., Bunik, V., Lindsay, H. & Lindsay, J. G. (1998). Subunit interactions in the mammalian alpha-ketoglutarate dehydrogenase complex. Evidence for direct association of the alpha-ketoglutarate dehydrogenase and dihydrolipoamide dehydrogenase components. The Journal of biological chemistry, 273, 24158-24164. McCormack, J. G. & Denton, R. M. (1979). The effects of calcium ions and adenine nucleotides on the activity of pig heart 2-oxoglutarate dehydrogenase complex. The Biochemical journal, 180, 533-544. McCormack, J. G. & Denton, R. M. (1981). A comparative study of the regulation of Ca2+ of the activities of the 2-oxoglutarate dehydrogenase complex and NAD+-isocitrate dehydrogenase from a variety of sources. The Biochemical journal, 196, 619-624. McCully, V., Burns, G. & Sokatch, J. R. (1986). Resolution of branched-chain oxo acid dehydrogenase complex of Pseudomonas aeruginosa PAO. The Biochemical journal, 233, 737-742. McLain, A. L., Cormier, P. J., Kinter, M. & Szweda, L. I. (2013). Glutathionylation of alpha-ketoglutarate dehydrogenase: the chemical nature and relative susceptibility of the cofactor lipoic acid to modification. Free radical biology & medicine, 61, 161-169. McMillan, P. J., Stimmler, L. M., Foth, B. J., McFadden, G. I. & Muller, S. (2005). The human malaria parasite Plasmodium falciparum possesses two distinct dihydrolipoamide dehydrogenases. Molecular microbiology, 55, 27-38. Melo, J. B., Agostinho, P. & Oliveira, C. R. (2002). Amyloid beta-peptide 25-35 reduces [3H]acetylcholine release in retinal neurons. Involvement of metabolic dysfunction. Amyloid: the international journal of experimental and clinical investigation: the official journal of the International Society of Amyloidosis, 9, 221-228. Meng, M. & Chuang, D. T. (1994). Site-directed mutagenesis and functional analysis of the active-site residues of the E2 component of bovine branched-chain alpha-keto acid dehydrogenase complex. Biochemistry, 33, 12879-12885. Menon, S. & Ragsdale, S. W. (1997). Mechanism of the Clostridium thermoaceticum pyruvate:ferredoxin oxidoreductase: evidence for the common catalytic intermediacy of the hydroxyethylthiamine pyropyrosphate radical. Biochemistry, 36, 8484-8494. Michelakis, E. D., Webster, L. & Mackey, J. R. (2008). Dichloroacetate (DCA) as a potential metabolic-targeting therapy for cancer. British journal of cancer, 99, 989-994. Miles, J. S. & Guest, J. R. (1987). Subgenes expressing single lipoyl domains of the pyruvate dehydrogenase complex of Escherichia coli. The Biochemical journal, 245, 869-874. Miller, J. R., Busby, R. W., Jordan, S. W., Cheek, J., Henshaw, T. F., Ashley, G. W., Broderick, J. B., Cronan, J. E. Jr. & Marletta, M. A. (2000). Escherichia coli LipA is a lipoyl synthase: in vitro biosynthesis of lipoylated pyruvate dehydrogenase complex from octanoyl-acyl carrier protein. Biochemistry, 39, 15166-15178. Milne, J. L., Shi, D., Rosenthal, P. B., Sunshine, J. S., Domingo, G. J., Wu, X., Brooks, B. R., Perham, R. N., Henderson, R. & Subramaniam, S. (2002). Molecular architecture and mechanism of an icosahedral pyruvate dehydrogenase complex: a multifunctional catalytic machine. The EMBO journal, 21, 5587-5598. Milne, J. L., Wu, X., Borgnia, M. J., Lengyel, J. S., Brooks, B. R., Shi, D., Perham, R. N. & Subramaniam, S. (2006). Molecular structure of a 9-MDa icosahedral pyruvate dehydrogenase subcomplex containing the E2 and E3 enzymes using cryoelectron microscopy. The Journal of biological chemistry, 281, 4364-4370. Min, A. K., Kim, M. K., Seo, H. Y., Kim, H. S., Jang, B. K., Hwang, J. S., Choi, H. S., Lee, K. U., Park, K. G. & Lee, I. K. (2010). Alpha-lipoic acid inhibits hepatic PAI-1 expression and fibrosis by inhibiting the TGF-beta signalling pathway. Biochemical and biophysical research communications, 393, 536-541. Mkrtchyan, G., Graf, A., Bettendorff, L. & Bunik, V. (2016). Cellular thiamine status is coupled to function of mitochondrial 2-oxoglutarate dehydrogenase. Neurochemistry international, 101, 66-75. Moreadith, R. W. & Lehninger, A. L. (1984). The pathways of glutamate and glutamine oxidation by tumor cell mitochondria. Role of mitochondrial NAD(P)+-dependent malic enzyme. The Journal of biological chemistry, 259, 6215-6221. Moreno-Sanchez, R., Marin-Hernandez, A., Saavedra, E., Pardo, J. P., Ralph, S. J. & Rodriguez-Enriquez, S. (2014). Who controls the ATP supply in cancer cells? Biochemistry lessons to understand cancer energy metabolism. The international journal of biochemistry & cell biology, 50, 10-23. Morikawa, T., Yasuno, R. & Wada, H. (2001). Do mammalian cells synthesize lipoic acid? Identification of a mouse cDNA encoding a lipoic acid synthase located in mitochondria. FEBS letters, 498, 16-21. Mouchiroud, L., Molin, L., Kasturi, P., Triba, M. N., Dumas, M. E., Wilson, M. C., Halestrap, A. P., Roussel, D., Masse, I., Dalliere, N., Segalat, L., Billaud, M. & Solari, F. (2011). Pyruvate imbalance mediates metabolic reprogramming and mimics lifespan extension by dietary restriction in Caenorhabditis elegans. Aging cell, 10, 39-54. Murin, R., Mohammadi, G., Leibfritz, D. & Hamprecht, B. (2009a). Glial metabolism of valine. Neurochemical research, 34, 1195-1203. Murin, R., Mohammadi, G., Leibfritz, D. & Hamprecht, B. (2009b). Glial metabolism of isoleucine. Neurochemical research, 34, 194-204. Murphy, G. E. & Jensen, G. J. (2005). Electron cryotomography of the E. coli pyruvate and 2-oxoglutarate dehydrogenase complexes. Structure, 13, 1765-1773. Nakai, T., Nakagawa, N., Maoka, N., Masui, R., Kuramitsu, S. & Kamiya, N. (2004). Ligand-induced conformational changes and a reaction intermediate in branched-chain 2-oxo acid dehydrogenase (E1) from Thermus thermophilus HB8, as revealed by X-ray crystallography. Journal of molecular biology, 337, 1011-1033. Nakanishi, I., Itoh, S., Suenobu, T. & Fukuzumi, S. (1997). Electron transfer properties of active aldehydes derived from thiamine coenzyme analogues. Chem Commun, 1927-1928. Nakatsukasa, K., Nishimura, T., Byrne, S. D., Okamoto, M., Takahashi-Nakaguchi, A., Chibana, H., Okumura, F. & Kamura, T. (2015). The Ubiquitin Ligase SCF(Ucc1) Acts as a Metabolic Switch for the Glyoxylate Cycle. Molecular cell, 59, 22-34. Neagle, J. C. & Lindsay, J. G. (1991). Selective proteolysis of the protein X subunit of the bovine heart pyruvate dehydrogenase complex. Effects on dihydrolipoamide dehydrogenase (E3) affinity and enzymic properties of the complex. The Biochemical journal, 278, 423-427. Nemeria, N. S., Ambrus, A., Patel, H., Gerfen, G., Adam-Vizi, V., Tretter, L., Zhou, J., Wang, J. & Jordan, F. (2014). Human 2-oxoglutarate dehydrogenase complex E1 component forms a thiamin-derived radical by aerobic oxidation of the enamine intermediate. The Journal of biological chemistry, 289, 29859-29873. Nemeria, N. S., Arjunan, P., Chandrasekhar, K., Mossad, M., Tittmann, K., Furey, W. & Jordan, F. (2010). Communication between thiamine cofactors in the Escherichia coli pyruvate dehydrogenase complex E1 component active centers: evidence for a “direct pathway” between the 4’-aminopyrimidine N1’ atoms. The Journal of biological chemistry, 285, 11197-11209. Nemeria, N. S., Ban’kovskii, A. A. & Gorenshtein, B. I. (1988). [Non-oxidative function of the pyruvate dehydrogenase complex in the brain of animals]. Doklady Akademii nauk SSSR, 298, 750-753. Nemeria, N. S., Shome, B., DeColli, A. A., Heflin, K., Begley, T. P., Meyers, C. F. & Jordan, F. (2016). Competence of Thiamine Diphosphate-Dependent Enzymes with 2’-Methoxythiamine Diphosphate Derived from Bacimethrin, a Naturally Occurring Thiamine Anti-vitamin. Biochemistry, 55, 1135-1148. Newman, J. C., He, W. & Verdin, E. (2012). Mitochondrial protein acylation and intermediary metabolism: regulation by sirtuins and implications for metabolic disease. The Journal of biological chemistry, 287, 42436-42443. Niebisch, A., Kabus, A., Schultz, C., Weil, B. & Bott, M. (2006). Corynebacterial protein kinase G controls 2-oxoglutarate dehydrogenase activity via the phosphorylation status of the OdhI protein. The Journal of biological chemistry, 281, 12300-12307. Nissen, J. D., Lykke, K., Bryk, J., Stridh, M. H., Zaganas, I., Skytt, D. M., Schousboe, A., Bak, L. K., Enard, W., Paabo, S. & Waagepetersen, H. S. (2016). Expression of the human isoform of glutamate dehydrogenase, hGDH2, augments TCA cycle capacity and oxidative metabolism of glutamate during glucose deprivation in astrocytes. Glia. Niu, X. D., Stoops, J. K. & Reed, L. J. (1990). Overexpression and mutagenesis of the catalytic domain of dihydrolipoamide acetyltransferase from Saccharomyces cerevisiae. Biochemistry, 29, 8614-8619. Nulton-Persson, A. C., Starke, D. W., Mieyal, J. J. & Szweda, L. I. (2003). Reversible inactivation of alpha-ketoglutarate dehydrogenase in response to alterations in the mitochondrial glutathione status. Biochemistry, 42, 4235-4242. Obayashi, M., Sato, Y., Harris, R. A. & Shimomura, Y. (2001). Regulation of the activity of branched-chain 2-oxo acid dehydrogenase (BCODH) complex by binding BCODH kinase. FEBS letters, 491, 50-54. O’Fallon, J. V. & Brosemer, R. W. (1977). Cellular localization of alpha-ketoglutarate: glyoxylate carboligase in rat tissues. Biochimica et biophysica acta, 499, 321-328. O’Hare, H. M., Duran, R., Cervenansky, C., Bellinzoni, M., Wehenkel, A. M., Pritsch, O., Obal, G., Baumgartner, J., Vialaret, J., Johnsson, K. & Alzari, P. M. (2008). Regulation of glutamate metabolism by protein kinases in mycobacteria. Molecular microbiology, 70, 1408-1423. Oizumi, J. & Hayakawa, K. (1990). Lipoamidase is a multiple hydrolase. The Biochemical journal, 271, 45-49. Oliver, R. M. & Reed, L. J. (1982). Multienzyme complexes. In J. R. Harris (Eds. ), Electron microscopy of proteins, 2, (pp. 1-48). London: Academic Press. Olson, M. S. (1989). Regulation of the mitochondrial multienzyme complexes in complex metabolic systems. Annals of the New York Academy of Sciences, 573, 218-229. Ono, K., Hakozaki, M., Kimura, A. & Kochi, H. (1987a). Purification, resolution, and reconstitution of rat liver branched-chain alpha-keto acid dehydrogenase complex. Journal of biochemistry, 101, 19-27. Ono, K., Hakozaki, M., Nishimaki, H. & Kochi, H. (1987b). Purification and characterization of human liver branched-chain alpha-keto acid dehydrogenase complex. Biochemical medicine and metabolic biology, 37, 133-141. Ostrow, K. L., Park, H. L., Hoque, M. O., Kim, M. S., Liu, J., Argani, P., Westra, W., Van Criekinge, W. & Sidransky, D. (2009). Pharmacologic unmasking of epigenetically silenced genes in breast cancer. Clinical cancer research: an official journal of the American Association for Cancer Research, 15, 1184-1191. Ozden, O., Park, S. H., Wagner, B. A., Yong Song, H., Zhu, Y., Vassilopoulos, A., Jung, B., Buettner, G. R. & Gius, D. (2014). SIRT3 deacetylates and increases pyruvate dehydrogenase activity in cancer cells. Free radical biology & medicine, 76, 163-172. Packman, L. C., Hale, G. & Perham, R. N. (1984a). Repeating functional domains in the pyruvate dehydrogenase multienzyme complex of Escherichia coli. The EMBO journal, 3, 1315-1319. Packman, L. C. & Perham, R. N. (1987). Limited proteolysis and sequence analysis of 2-oxo acid dehydrogenase complexes from Escherichia coli. Cleavage sites and domains in the dihydrolipoamide acyltransferase components. The Biochemical journal, 242, 531-538. Packman, L. C., Perham, R. N. & Roberts, G. C. (1984b). Domain structure and 1H-n.m.r. spectroscopy of the pyruvate dehydrogenase complex of Bacillus stearothermophilus. The Biochemical journal, 217, 219-227. Papandreou, I., Cairns, R. A., Fontana, L., Lim, A. L. & Denko, N. C. (2006). HIF-1 mediates adaptation to hypoxia by actively downregulating mitochondrial oxygen consumption. Cell metabolism, 3, 187-197. Pardo, B., Contreras, L., Serrano, A., Ramos, M., Kobayashi, K., Iijima, M., Saheki, T. & Satrustegui, J. (2006). Essential role of aralar in the transduction of small Ca2+ signals to neuronal mitochondria. The Journal of biological chemistry, 281, 1039-1047. Park, J., Chen, Y., Tishkoff, D. X., Peng, C., Tan, M., Dai, L., Xie, Z., Zhang, Y., Zwaans, B. M., Skinner, M. E., Lombard, D. B. & Zhao, Y. (2013). SIRT5-mediated lysine desuccinylation impacts diverse metabolic pathways. Molecular cell, 50, 919-930. Parkhomenko, Y. M., Kudryavtsev, P. A., Pylypchuk, S. Y., Chekhivska, L. I., Stepanenko, S. P., Sergiichuk, A. A. & Bunik, V. I. (2011). Chronic alcoholism in rats induces a compensatory response, preserving brain thiamine diphosphate, but the brain 2-oxo acid dehydrogenases are inactivated despite unchanged coenzyme levels. Journal of neurochemistry, 117, 1055-1065. Parkhomenko, Yu. M., Chernysh, I. Iu., Churilova, T. Ia., Khalmuradov, A. G. (1987). Effect of thiamine phosphates on the activity of regulatory enzymes of the pyruvate dehydrogenase complex. Ukr Biokhim Zh, 59, 49-54. [Article in Russian]. Patel, M. S. (1974). Inhibition by the branched-chain 2-oxo acids of the 2-oxoglutarate dehydrogenase complex in developing rat and human brain. The Biochemical journal, 144, 91-97. Patel, M. S. & Korotchkina, L. G. (2001). Regulation of mammalian pyruvate dehydrogenase complex by phosphorylation: complexity of multiple phosphorylation sites and kinases. Experimental & molecular medicine, 33, 191-197. Patel, M. S. & Korotchkina, L. G. (2006). Regulation of the pyruvate dehydrogenase complex. Biochemical Society transactions, 34, 217-222. Patel, M. S., Nemeria, N. S., Furey, W. & Jordan, F. (2014). The pyruvate dehydrogenase complexes: structure-based function and regulation. The Journal of biological chemistry, 289, 16615-16623. Patel, M. S. & Roche, T. E. (1990). Molecular biology and biochemistry of pyruvate dehydrogenase complexes. FASEB journal: official publication of the Federation of American Societies for Experimental Biology, 4, 3224-3233. Pawelczyk, T. & Angielski, S. (1984). Cooperation of Ca2+ and pH in regulation of the activity of the 2-oxoglutarate dehydrogenase complex and its components from bovine kidney cortex. Acta biochimica Polonica, 31, 289-305. Paxton, R. & Harris, R. A. (1982). Isolation of rabbit liver branched-chain alpha-ketoacid dehydrogenase and regulation by phosphorylation. The Journal of biological chemistry, 257, 14433-14439. Paxton, R. & Harris, R. A. (1984). Regulation of branched-chain alpha-ketoacid dehydrogenase kinase. Archives of biochemistry and biophysics, 231, 48-57. Paxton, R., Kuntz, M. & Harris, R. A. (1986). Phosphorylation sites and inactivation of branched-chain alpha-ketoacid dehydrogenase isolated from rat heart, bovine kidney, and rabbit liver, kidney, heart, brain, and skeletal muscle. Archives of biochemistry and biophysics, 244, 187-201. Perham, R. N. (1991). Domains, motifs, and linkers in 2-oxo acid dehydrogenase multienzyme complexes: a paradigm in the design of a multifunctional protein. Biochemistry, 30, 8501-8512. Perham, R. N. (1996). Interaction of protein domains in the assembly and mechanism of 2-oxoacid dehydrogenase multienzyme complexes. In M. S. Patel, T. E. Roche & R. A. Harris (Eds. ), Alphа-keto acid dehydrogenase complexes, (pp. 1-15). Basel-Boston-Berlin: Birkhaeuser Verlag. Perham, R. N. (2000). Swinging arms and swinging domains in multifunctional enzymes: catalytic machines for multistep reactions. Annual review of biochemistry, 69, 961-1004. Perham, R. N. & Roberts, G. C. (1981). Limited proteolysis and proton n.m.r. spectroscopy of the 2-oxoglutarate dehydrogenase multienzyme complex of Escherichia coli. The Biochemical journal, 199, 733-740. Petrov, S. A. (1992). [Thiamine metabolism in mouse organs and tissues in vivo and in vitro]. Fiziologicheskii zhurnal, 38, 79-85. Pettit, F. H., Hamilton, L., Munk, P., Namihira, G., Eley, M. H., Willms, C. R. & Reed, L. J. (1973). Alpha-keto acid dehydrogenase complexes. XIX. Subunit structure of the Escherichia coli alpha-ketoglutarate dehydrogenase complex. The Journal of biological chemistry, 248, 5282-5290. Pettit, F. H., Roche, T. E. & Reed, L. J. (1972). Function of calcium ions in pyruvate dehydrogenase phosphatase activity. Biochemical and biophysical research communications, 49, 563-571. Pettit, F. H., Yeaman, S. J. & Reed, L. J. (1978). Purification and characterization of branched-chain alpha-keto acid dehydrogenase complex of bovine kidney. Proceedings of the National Academy of Sciences of the United States of America, 75, 4881-4885. Piao, L., Sidhu, V. K., Fang, Y. H., Ryan, J. J., Parikh, K. S., Hong, Z., Toth, P. T., Morrow, E., Kutty, S., Lopaschuk, G. D. & Archer, S. L. (2013). FOXO1-mediated upregulation of pyruvate dehydrogenase kinase-4 (PDK4) decreases glucose oxidation and impairs right ventricular function in pulmonary hypertension: therapeutic benefits of dichloroacetate. Journal of molecular medicine, 91, 333-346. Pontoizeau, C., Habarou, F., Brassier, A., Veauville-Merllie, A., Grisel, C., Arnoux, J. B., Vianey-Saban, C., Barouki, R., Chadefaux-Vekemans, B., Acquaviva, C., de Lonlay, P. & Ottolenghi, C. (2016). Hyperprolinemia in Type 2 Glutaric Aciduria and MADD-Like Profiles. JIMD reports, 27, 39-45. Popov, K. M., Zhao, Y., Shimomura, Y., Kuntz, M. J. & Harris, R. A. (1992). Branched-chain alpha-ketoacid dehydrogenase kinase. Molecular cloning, expression, and sequence similarity with histidine protein kinases. The Journal of biological chemistry, 267, 13127-13130. Pratt, M. L. & Roche, T. E. (1979). Mechanism of pyruvate inhibition of kidney pyruvate dehydrogenasea kinase and synergistic inhibition by pyruvate and ADP. The Journal of biological chemistry, 254, 7191-7196. Priestman, D. A., Orfali, K. A. & Sugden, M. C. (1996). Pyruvate inhibition of pyruvate dehydrogenase kinase. Effects of progressive starvation and hyperthyroidism in vivo, and of dibutyryl cyclic AMP and fatty acids in cultured cardiac myocytes. FEBS letters, 393, 174-178. Pustynnikov, M. G., Neif, H., Usmanov, R. A., Schellenberger, A. & Kochetov, G. A. (1986). Functional groups of thiamine pyrophosphate in holotransketolase. Biochemistry (Mosc), 51, 1003-1016. Quinlan, C. L., Goncalves, R. L., Hey-Mogensen, M., Yadava, N., Bunik, V. I. & Brand, M. D. (2014). The 2-oxoacid dehydrogenase complexes in mitochondria can produce superoxide/hydrogen peroxide at much higher rates than complex I. The Journal of biological chemistry, 289, 8312-8325. Raasch, K., Bocola, M., Labahn, J., Leitner, A., Eggeling, L. & Bott, M. (2014). Interaction of 2-oxoglutarate dehydrogenase OdhA with its inhibitor OdhI in Corynebacterium glutamicum: Mutants and a model. Journal of biotechnology, 191, 99-105. Rackham, O., Shearwood, A. M., Thyer, R., McNamara, E., Davies, S. M., Callus, B. A., Miranda-Vizuete, A., Berners-Price, S. J., Cheng, Q., Arner, E. S. & Filipovska, A. (2011). Substrate and inhibitor specificities differ between human cytosolic and mitochondrial thioredoxin reductases: Implications for development of specific inhibitors. Free radical biology & medicine, 50, 689-699. Raddatz, G. & Bisswanger, H. (1996). Interaction between the lipoyl domain and the cofactors of the pyruvate dehydrogenase complex. In H. Bisswanger & A. Schellenberger (Eds. ), Biochemistry and physiology of thiamine diphosphate enzymes, (pp. 272-277). Prien: A.u.C. Intemann. Raddatz, G. & Bisswanger, H. (1997). Receptor site and stereospecifity of dihydrolipoamide dehydrogenase for R- and S-lipoamide: a molecular modeling study. Journal of biotechnology, 58, 89-100. Raddatz, G., Kruft, V. & Bunik, V. (2000). Structural determinants for the efficient and specific interaction of thioredoxin with 2-oxoacid dehydrogenase complexes. Appl Biochem Biotech, 88, 77-96. Radke, G. A., Ono, K., Ravindran, S. & Roche, T. E. (1993). Critical role of a lipoyl cofactor of the dihydrolipoyl acetyltransferase in the binding and enhanced function of the pyruvate dehydrogenase kinase. Biochemical and biophysical research communications, 190, 982-991. Rahmatullah, M., Radke, G. A., Andrews, P. C. & Roche, T. E. (1990). Changes in the core of the mammalian-pyruvate dehydrogenase complex upon selective removal of the lipoyl domain from the transacetylase component but not from the protein X component. The Journal of biological chemistry, 265, 14512-14517. Reche, P. A. (2000). Lipoylating and biotinylating enzymes contain a homologous catalytic module. Protein science: a publication of the Protein Society, 9, 1922-1929. Reed, L. J. (1974). Multienzyme complexes. Accounts of chemical research, 7, 40-46. Reed, L. J. & Debusk, B. G. (1952a). A conjugate of alpha-lipoic acid required for oxidation of pyruvate and alpha-ketoglutarate by an Escherichia coli mutant. The Journal of biological chemistry, 199, 873-880. Reed, L. J. & Debusk, B. G. (1952b). Chemical nature of an alpha-lipoic acid conjugate required for oxidation of pyruvate and alpha-ketoglutarate by an Escherichia coli mutant. The Journal of biological chemistry, 199, 881-888. Reed, L. J. & Hackert, M. L. (1990). Structure-function relationships in dihydrolipoamide acyltransferases. The Journal of biological chemistry, 265, 8971-8974. Reed, L. J. & Oliver, R. M. (1968). The multienzyme alpha-keto acid dehydrogenase complexes. Brookhaven symposia in biology, 21, 397-412. Reed, L. J., Pettit, F. H., Eley, M. H., Hamilton, L., Collins, J. H. & Oliver, R. M. (1975). Reconstitution of the Escherichia coli pyruvate dehydrogenase complex. Proceedings of the National Academy of Sciences of the United States of America, 72, 3068-3072. Reitman, Z. J., Choi, B. D., Spasojevic, I., Bigner, D. D., Sampson, J. H. & Yan, H. (2012). Enzyme redesign guided by cancer-derived IDH1 mutations. Nature chemical biology, 8, 887-889. Reitman, Z. J. & Yan, H. (2010). Isocitrate dehydrogenase 1 and 2 mutations in cancer: alterations at a crossroads of cellular metabolism. Journal of the National Cancer Institute, 102, 932-941. Rice, J. E., Dunbar, B. & Lindsay, J. G. (1992). Sequences directing dihydrolipoamide dehydrogenase (E3) binding are located on the 2-oxoglutarate dehydrogenase (E1) component of the mammalian 2-oxoglutarate dehydrogenase multienzyme complex. The EMBO journal, 11, 3229-3235. Richardson, A. D. & Moscow, J. A. (2010). Can an enzyme cofactor be a factor in malignant progression? Cancer biology & therapy, 10, 1112-1114. Robien, M. A., Clore, G. M., Omichinski, J. G., Perham, R. N., Appella, E., Sakaguchi, K. & Gronenborn, A. M. (1992). Three-dimensional solution structure of the E3-binding domain of the dihydrolipoamide succinyltransferase core from the 2-oxoglutarate dehydrogenase multienzyme complex of Escherichia coli. Biochemistry, 31, 3463-3471. Roche, T. E., Baker, J. C., Yan, X., Hiromasa, Y., Gong, X., Peng, T., Dong, J., Turkan, A. & Kasten, S. A. (2001). Distinct regulatory properties of pyruvate dehydrogenase kinase and phosphatase isoforms. Progress in nucleic acid research and molecular biology, 70, 33-75. Roche, T. E. & Hiromasa, Y. (2007). Pyruvate dehydrogenase kinase regulatory mechanisms and inhibition in treating diabetes, heart ischemia, and cancer. Cellular and molecular life sciences, 64, 830-849. Roche, T. E., Hiromasa, Y., Turkan, A., Gong, X., Peng, T., Yan, X., Kasten, S. A., Bao, H. & Dong, J. (2003). Essential roles of lipoyl domains in the activated function and control of pyruvate dehydrogenase kinases and phosphatase isoform 1. European journal of biochemistry/FEBS, 270, 1050-1056. Roche, T. E., Powers-Greenwood, S. L., Shi, W. F., Zhang, W. B., Ren, S. Z., Roche, E. D., Cox, D. J. & Sorensen, C. M. (1993). Sizing of bovine heart and kidney pyruvate dehydrogenase complex and dihydrolipoyl transacetylase core by quasielastic light scattering. Biochemistry, 32, 5629-5637. Rodriguez-Zavala, J. S., Pardo, J. P. & Moreno-Sanchez, R. (2000). Modulation of 2-oxoglutarate dehydrogenase complex by inorganic phosphate, Mg(2+), and other effectors. Archives of biochemistry and biophysics, 379, 78-84. Romero, F. J., Ordonez, I., Arduini, A. & Cadenas, E. (1992). The reactivity of thiols and disulfides with different redox states of myoglobin. Redox and addition reactions and formation of thiyl radical intermediates. The Journal of biological chemistry, 267, 1680-1688. Rowles, J., Scherer, S. W., Xi, T., Majer, M., Nickle, D. C., Rommens, J. M., Popov, K. M., Harris, R. A., Riebow, N. L., Xia, J., Tsui, L. C., Bogardus, C. & Prochazka, M. (1996). Cloning and characterization of PDK4 on 7q21.3 encoding a fourth pyruvate dehydrogenase kinase isoenzyme in human. The Journal of biological chemistry, 271, 22376-22382. Ruffo, A., Testa, E., Adinolfi, A. & Pelizza, G. (1962). Control of the etric acid cycle by glyoxylate. I. A new inhibitor of aconitase formed by the condensation of glyoxylate with oxaloacetate. The Biochemical journal, 85, 588-593. Russell, G. C. & Guest, J. R. (1991). Sequence similarities within the family of dihydrolipoamide acyltransferases and discovery of a previously unidentified fungal enzyme. Biochimica et biophysica acta, 1076, 225-232. Russell, R. R. 3rd & Taegtmeyer, H. (1992). Coenzyme A sequestration in rat hearts oxidizing ketone bodies. The Journal of clinical investigation, 89, 968-973. Sahlman, L. & Williams, C. H. Jr. (1989). Lipoamide dehydrogenase from Escherichia coli. Steady-state kinetics of the physiological reaction. The Journal of biological chemistry, 264, 8039-8045. Samoilov, M. O., Rybnikova, E. A., Tjulkova, E. I., Spyrou, G. & Pelto-Huikko, M. (2002). The mitochondrial antioxidants thioredoxin-2 and Mn-superoxide dismutase are involved in the mechanisms of brain hypoxic tolerance. Doklady biological sciences: proceedings of the Academy of Sciences of the USSR, Biological sciences sections, 387, 498-500. Sanadi, D. R. (1963). Pyruvate and a-ketoglutarate oxidation enzymes. The Enzymes, 7, 307-344. Sanadi, D. R., Littlefield, J. W. & Bock, R. M. (1952). Studies on alpha-ketoglutaric oxidase. II. Purification and properties. The Journal of biological chemistry, 197, 851-862. Sanderson, S. J., Miller, C. & Lindsay, J. G. (1996). Stoichiometry, organisation and catalytic function of protein X of the pyruvate dehydrogenase complex from bovine heart. European journal of biochemistry/FEBS, 236, 68-77. Santos, S. S., Gibson, G. E., Cooper, A. J., Denton, T. T., Thompson, C. M., Bunik, V. I., Alves, P. M. & Sonnewald, U. (2006). Inhibitors of the alpha-ketoglutarate dehydrogenase complex alter [1-13C]glucose and [U-13C]glutamate metabolism in cerebellar granule neurons. Journal of neuroscience research, 83, 450-458. Saunier, E., Benelli, C. & Bortoli, S. (2016). The pyruvate dehydrogenase complex in cancer: An old metabolic gatekeeper regulated by new pathways and pharmacological agents. International journal of cancer, 138, 809-817. Schaffer, S., Gruber, J., Ng, L. F., Fong, S., Wong, Y. T., Tang, S. Y. & Halliwell, B. (2011). The effect of dichloroacetate on health- and lifespan in C. elegans. Biogerontology, 12, 195-209. Schellenberger, A. (1969). Chemische aspekte zum funktions mechanismus der Hefe-pyruvate-decarboxylase (1). Wissenschaftliche Zeitschrift der Martin-Luther-Universität Halle-Wittenberg, Mathematisch-naturwissenschaftliche Reihe, 18, 319-340. Schellenberger, A. (1982). The amino group and steric factors in thiamine catalysis. Annals of the New York Academy of Sciences, 378, 51-62. Schellenberger, A. (1998). Sixty years of thiamine diphosphate biochemistry. Biochimica et biophysica acta, 1385, 177-186. Schlossberg, M. A., Bloom, R. J., Richert, D. A. & Westerfeld, W. W. (1970). Carboligase activity of alpha-ketoglutarate dehydrogenase. Biochemistry, 9, 1148-1153. Schmincke-Ott, E. & Bisswanger, H. (1981). Dihydrolipoamide dehydrogenase component of the pyruvate dehydrogenase complex from Escherichia coli K12. Comparative characterization of the free and the complex-bound component. European journal of biochemistry/FEBS, 114, 413-420. Schmitt, B. (1976). Pyruvate dehydrogenase in Escherichia coli: an active 17S species in crude extracts. Biochimie, 58, 1405-1407. Schultz, C., Niebisch, A., Schwaiger, A., Viets, U., Metzger, S., Bramkamp, M. & Bott, M. (2009). Genetic and biochemical analysis of the serine/threonine protein kinases PknA, PknB, PknG and PknL of Corynebacterium glutamicum: evidence for non-essentiality and for phosphorylation of OdhI and FtsZ by multiple kinases. Molecular microbiology, 74, 724-741. Schulze, E., Westphal, A. H., Boumans, H. & de Kok, A. (1991a). Site-directed mutagenesis of the dihydrolipoyl transacetylase component (E2p) of the pyruvate dehydrogenase complex from Azotobacter vinelandii. Binding of the peripheral components E1p and E3. European journal of biochemistry/FEBS, 202, 841-848. Schulze, E., Westphal, A. H., Hanemaaijer, R. & de Kok, A. (1993). Structure/function relationships in the pyruvate dehydrogenase complex from Azotobacter vinelandii. Role of the linker region between the binding and catalytic domain of the dihydrolipoyl transacetylase component. European journal of biochemistry/FEBS, 211, 591-599. Schulze, E., Westphal, A. H., Obmolova, G., Mattevi, A., Hol, W. G. & de Kok, A. (1991b). The catalytic domain of the dihydrolipoyl transacetylase component of the pyruvate dehydrogenase complex from Azotobacter vinelandii and Escherichia coli. Expression, purification, properties and preliminary X-ray analysis. European journal of biochemistry/FEBS, 201, 561-568. Schulze, E., Westphal, A. H., Veeger, C. & de Kok, A. (1992). Reconstitution of pyruvate dehydrogenase multienzyme complexes based on chimeric core structures from Azotobacter vinelandii and Escherichia coli. European journal of biochemistry/FEBS, 206, 427-435. Scott, B. C., Aruoma, O. I., Evans, P. J., O’Neill, C., Van der Vliet, A., Cross, C. E., Tritschler, H. & Halliwell, B. (1994). Lipoic and dihydrolipoic acids as antioxidants. A critical evaluation. Free radical research, 20, 119-133. Searls, R. L., Peters, J. M. & Sanadi, D. R. (1961). alpha-Ketoglutaric dehydrogenase. X. On the mechanism of dihydrolipoyl dehydrogenase reaction. The Journal of biological chemistry, 236, 2317-2322. Seifert, F., Ciszak, E., Korotchkina, L., Golbik, R., Spinka, M., Dominiak, P., Sidhu, S., Brauer, J., Patel, M. S. & Tittmann, K. (2007). Phosphorylation of serine 264 impedes active site accessibility in the E1 component of the human pyruvate dehydrogenase multienzyme complex. Biochemistry, 46, 6277-6287. Selivanov, V. A., Zakrzhevskaya, D. T. & Goldstein, B. N. (1994). Activity oscillations predicted for pyruvate dehydrogenase complexes. FEBS letters, 345, 151-153. Sen, T., Sen, N., Noordhuis, M. G., Ravi, R., Wu, T. C., Ha, P. K., Sidransky, D. & Hoque, M. O. (2012). OGDHL is a modifier of AKT-dependent signalling and NF-kappaB function. PloS one, 7, e48770. Severin, S. E., Gomazkova, V. S., Krasovskaia, O. E. & Mel’nikova, O. F. (1976). [Kinetic properties of alpha-ketoglutarate dehydrogenase from pigeon pectoral muscle]. Doklady Akademii nauk SSSR, 229, 755-757. Severin, S. E., Gomazkova, V. S., Krasovskaia, O. E. & Stafeeva, O. A. (1978). [Kinetic properties of the alpha-ketoglutarate dehydrogenase complex from pigeon breast muscle]. Biokhimiia, 43, 2241-2248. Shan, C., Kang, H. B., Elf, S., Xie, J., Gu, T. L., Aguiar, M., Lonning, S., Hitosugi, T., Chung, T. W., Arellano, M., Khoury, H. J., Shin, D. M., Khuri, F. R., Boggon, T. J. & Fan, J. (2014). Tyr-94 phosphorylation inhibits pyruvate dehydrogenase phosphatase 1 and promotes tumor growth. The Journal of biological chemistry, 289, 21413-21422. Sharma, B., Lawrence, D. W. & Hutchison, M. G. (2017). Branched Chain Amino Acids (BCAAs) and Traumatic Brain Injury: A Systematic Review. The Journal of head trauma rehabilitation, DOI: 10.1097/ HTR.0000000000000280. Shaw, R. J. (2006). Glucose metabolism and cancer. Current opinion in cell biology, 18, 598-608. She, P., Bunpo, P., Cundiff, J. K., Wek, R. C., Harris, R. A. & Anthony, T. G. (2013). General control nonderepressible 2 (GCN2) kinase protects oligodendrocytes and white matter during branched-chain amino acid deficiency in mice. The Journal of biological chemistry, 288, 31250-31260. Sheng, X. & Liu, Y. (2013). Theoretical study of the catalytic mechanism of E1 subunit of pyruvate dehydrogenase multienzyme complex from Bacillus stearothermophilus. Biochemistry, 52, 8079-8093. Shestopalov, A. I. & Kristal, B. S. (2007). Branched chain keto-acids exert biphasic effects on alpha-ketoglutarate-stimulated respiration in intact rat liver mitochondria. Neurochemical research, 32, 947-951. Shibata, K. & Sakamoto, M. (2016). Urinary Branched-Chain 2-Oxo Acids as a Biomarker for Function of B-Group Vitamins in Humans. Journal of nutritional science and vitaminology, 62, 220-228. Shim da, J., Nemeria, N. S., Balakrishnan, A., Patel, H., Song, J., Wang, J., Jordan, F. & Farinas, E. T. (2011). Assignment of function to histidines 260 and 298 by engineering the E1 component of the Escherichia coli 2-oxoglutarate dehydrogenase complex; substitutions that lead to acceptance of substrates lacking the 5-carboxyl group. Biochemistry, 50, 7705-7709. Shimomura, Y., Obayashi, M., Murakami, T. & Harris, R. A. (2001). Regulation of branched-chain amino acid catabolism: nutritional and hormonal regulation of activity and expression of the branched-chain alpha-keto acid dehydrogenase kinase. Current opinion in clinical nutrition and metabolic care, 4, 419-423. Shimomura, Y., Paxton, R., Ozawa, T. & Harris, R. A. (1987). Purification of branched-chain alpha-ketoacid dehydrogenase complex from rat liver. Analytical biochemistry, 163, 74-78. Siemieniuk, M., Czyzewska, U., Strumilo, S. & Tylicki, A. (2016). Thiamine antivitamins--an opportunity of therapy of fungal infections caused by Malassezia pachydermatis and Candida albicans. Mycoses, 59, 108-116. Smolka, M. B., Martins-de-Souza, D., Winck, F. V., Santoro, C. E., Castellari, R. R., Ferrari, F., Brum, I. J., Galembeck, E., Della Coletta Filho, H., Machado, M. A., Marangoni, S. & Novello, J. C. (2003). Proteome analysis of the plant pathogen Xylella fastidiosa reveals major cellular and extracellular proteins and a peculiar codon bias distribution. Proteomics, 3, 224-237. Smolkova, K., Dvorak, A., Zelenka, J., Vitek, L. & Jezek, P. (2015). Reductive carboxylation and 2-hydroxyglutarate formation by wild-type IDH2 in breast carcinoma cells. The international journal of biochemistry & cell biology, 65, 125-133. Smolle, M., Prior, A. E., Brown, A. E., Cooper, A., Byron, O. & Lindsay, J. G. (2006). A new level of architectural complexity in the human pyruvate dehydrogenase complex. The Journal of biological chemistry, 281, 19772-19780. Snoep, J. L., de Graef, M. R., Westphal, A. H., de Kok, A., Teixeira de Mattos, M. J. & Neijssel, O. M. (1993). Differences in sensitivity to NADH of purified pyruvate dehydrogenase complexes of Enterococcus faecalis, Lactococcus lactis, Azotobacter vinelandii and Escherichia coli: implications for their activity in vivo. FEMS microbiology letters, 114, 279-283. Sokatch, J. R., McCully, V. & Roberts, C. M. (1981). Purification of a branched-chain keto acid dehydrogenase from Pseudomonas putida. Journal of bacteriology, 148, 647-652. Sreider, C. M., Grinblat, L. & Stoppani, A. O. (1992). Reduction of nitrofuran compounds by heart lipoamide dehydrogenase: role of flavin and the reactive disulfide groups. Biochemistry international, 28, 323-334. Stafeeva, O. A., Gomazkova, V. S. & Severin, S. E. (1983). Essential arginine residues for catalytic and regulatory functions of alpha-ketoglutarate dehydrogenase from pigeon breast muscle. Biochemistry international, 6, 315-321. Starkov, A. A. (2013). An update on the role of mitochondrial alpha-ketoglutarate dehydrogenase in oxidative stress. Molecular and cellular neurosciences, 55, 13-16. Sterling, G. H., McCafferty, M. R. & O’Neill, J. J. (1981). beta-Hydroxybutyrate as a precursor to the acetyl moiety of acetylcholine. Journal of neurochemistry, 37, 1250-1259. Stoops, J. K., Baker, T. S., Schroeter, J. P., Kolodziej, S. J., Niu, X. D. & Reed, L. J. (1992). Three-dimensional structure of the truncated core of the Saccharomyces cerevisiae pyruvate dehydrogenase complex determined from negative stain and cryoelectron microscopy images. The Journal of biological chemistry, 267, 24769-24775. Stoyanovsky, D. A., Goldman, R., Claycamp, H. G. & Kagan, V. E. (1995). Phenoxyl radical-induced thiol-dependent generation of reactive oxygen species: implications for benzene toxicity. Archives of biochemistry and biophysics, 317, 315-323. Stroev, S. A., Gluschenko, T. S., Tjulkova, E. I., Spyrou, G., Rybnikova, E. A., Samoilov, M. O. & Pelto-Huikko, M. (2004). Preconditioning enhances the expression of mitochondrial antioxidant thioredoxin-2 in the forebrain of rats exposed to severe hypobaric hypoxia. Journal of neuroscience research, 78, 563-569. Strumilo, S. (2005). Short-term regulation of the alpha-ketoglutarate dehydrogenase complex by energy-linked and some other effectors. Biochemistry (Mosc), 70, 726-729. Strumilo, S. A. (1983). [The role of Ca++ in regulation of oxoglutarate dehydrogenase complex activity from bovine adrenal cortex]. Ukrainskii biokhimicheskii zhurnal, 55, 415-419. Strumilo, S. A. (1988). [Regulation of the activity of the oxoglutarate dehydrogenase complex of animal origin (review)]. Voprosy meditsinskoi khimii, 34, 2-7. Strumilo, S. A., Taranda, N. I. & Vinogradov, V. V. (1981). [Role of phosphate and divalent metal ions in regulation of the activity of the alpha-ketoglutarate dehydrogenase complex from adrenal cortex]. Biokhimiia, 46, 156-161. Strumilo, S. A., Taranda, N. I. & Vinogradov, V. V. (1982a). [Peculiarities of the regulation of adrenal oxoglutarate dehydrogenase complex by NADH and adenosine diphosphate]. Biokhimiia, 47, 724-732. Strumilo, S. A., Taranda, N. I. & Vinogradov, V. V. (1982b). [Role of ATP in regulating the oxoglutarate dehydrogenase complex of the adrenal cortex]. Voprosy meditsinskoi khimii, 28, 59-61. Strumilo, S. A., Taranda, N. I. & Vinogradov, V. V. (1983). Cooperative character of the interaction of adenosine-diphosphate with oxoglutarate dehydrogenase complex from adrenal cortex. Doklady Akademii Nauk BSSR, 27, 269-271. Strumilo, S. A., Vinogradov, V. V. & Senkevich, S. B., 1980. [Kinetic and regulatory properties of alpha-ketoglutarate dehydrogenase complex from bovine adrenals]. Ukrainskii biokhimicheskii zhurnal, 52, 321-324. Stuart, S. D., Schauble, A., Gupta, S., Kennedy, A. D., Keppler, B. R., Bingham, P. M. & Zachar, Z. (2014). A strategically designed small molecule attacks alpha-ketoglutarate dehydrogenase in tumor cells through a redox process. Cancer & metabolism, 2, 4. Sugden, P. H. & Randle, P. J. (1978). Regulation of pig heart pyruvate dehydrogenase by phosphorylation. Studies on the subunit and phosphorylation stoicheiometries. The Biochemical journal, 173, 659-668. Sumegi, B. & Alkonyi, I. (1983a). Elementary steps in the reaction of the pyruvate dehydrogenase complex from pig heart. Kinetics of thiamine diphosphate binding to the complex. European journal of biochemistry/FEBS, 136, 347-353. Sumegi, B. & Alkonyi, I. (1983b). Paracatalytic inactivation of pig heart pyruvate dehydrogenase complex. Archives of biochemistry and biophysics, 223, 417-424. Sumegi, B., Liposits, Z., Inman, L., Paull, W. K. & Srere, P. A. (1987). Electron microscopic study on the size of pyruvate dehydrogenase complex in situ. European journal of biochemistry/FEBS, 169, 223-230. Sumegi, B. & Srere, P. A. (1984). Complex I binds several mitochondrial NAD-coupled dehydrogenases. The Journal of biological chemistry, 259, 15040-15045. Sun, J., Morgan, M., Shen, R. F., Steenbergen, C. & Murphy, E. (2007). Preconditioning results in S-nitrosylation of proteins involved in regulation of mitochondrial energetics and calcium transport. Circulation research, 101, 1155-1163. Surendran, S., Michals-Matalon, K., Krywawych, S., Qazi, Q. H., Tuchman, R., Rady, P. L., Tyring, S. K. & Matalon, R. (2002). DOOR syndrome: deficiency of E1 component of the 2-oxoglutarate dehydrogenase complex. American journal of medical genetics, 113, 371-374. Sutendra, G., Kinnaird, A., Dromparis, P., Paulin, R., Stenson, T. H., Haromy, A., Hashimoto, K., Zhang, N., Flaim, E. & Michelakis, E. D. (2014). A nuclear pyruvate dehydrogenase complex is important for the generation of acetyl-CoA and histone acetylation. Cell, 158, 84-97. Sutendra, G. & Michelakis, E. D. (2013). Pyruvate dehydrogenase kinase as a novel therapeutic target in oncology. Frontiers in oncology, 3, 38. Suzuki, K. & Reed, L. J. (1963). Lipoamidase. The Journal of biological chemistry, 238, 4021-4025. Szutowicz, A., Bielarczyk, H., Jankowska-Kulawy, A., Pawelczyk, T. & Ronowska, A. (2013). Acetyl-CoA the key factor for survival or death of cholinergic neurons in course of neurodegenerative diseases. Neurochemical research, 38, 1523-1542. Szutowicz, A., Bielarczyk, H., Ronowska, A., Gul-Hinc, S., Klimaszewska-Lata, J., Dys, A., Zysk, M. & Pawelczyk, T. (2014). Intracellular redistribution of acetyl-CoA, the pivotal point in differential susceptibility of cholinergic neurons and glial cells to neurodegenerative signals. Biochemical Society transactions, 42, 1101-1106. Szutowicz, A., Tomaszewicz, M. & Bielarczyk, H. (1996). Disturbances of acetyl-CoA, energy and acetylcholine metabolism in some encephalopathies. Acta neurobiologiae experimentalis, 56, 323-339. Tabatabaie, T., Potts, J. D. & Floyd, R. A. (1996). Reactive oxygen species-mediated inactivation of pyruvate dehydrogenase. Archives of biochemistry and biophysics, 336, 290-296. Tanaka, N., Koike, K., Hamada, M., Otsuka, K. I., Suematsu, T. & Koike, M. (1972). Mammalian -keto acid dehydrogenase complexes. VII. Resolution and reconstitution of the pig heart 2-oxoglutarate dehydrogenase complex. The Journal of biological chemistry, 247, 4043-4049. Tanaka, T., Hosoi, F., Yamaguchi-Iwai, Y., Nakamura, H., Masutani, H., Ueda, S., Nishiyama, A., Takeda, S., Wada, H., Spyrou, G. & Yodoi, J. (2002). Thioredoxin-2 (TRX-2) is an essential gene regulating mitochondria-dependent apoptosis. The EMBO journal, 21, 1695-1703. Taylor, A. E., Millar, R. E., Carmichael, A., Cogdell, R. J. & Lindsay, J. G. (1993). Dihydrolipoamide dehydrogenase in plants: differences in the mitochondrial and chloroplastic forms. Biochemical Society transactions, 21, 38S. Teague, W. M., Pettit, F. H., Wu, T. L., Silberman, S. R. & Reed, L. J. (1982). Purification and properties of pyruvate dehydrogenase phosphatase from bovine heart and kidney. Biochemistry, 21, 5585-5592. Templeton, D. M., Hollebone, B. R. & Tsai, C. S. (1980). Magnetic circular dichroism studies on the active-site flavin of lipoamide dehydrogenase. Biochemistry, 19, 3868-3873. Thelen, J. J., Miernyk, J. A. & Randall, D. D. (2000). Pyruvate dehydrogenase kinase from Arabidopsis thaliana: a protein histidine kinase that phosphorylates serine residues. The Biochemical journal, 349, 195-201. Thelen, J. J., Muszynski, M. G., Miernyk, J. A. & Randall, D. D. (1998). Molecular analysis of two pyruvate dehydrogenase kinases from maize. The Journal of biological chemistry, 273, 26618-26623. Tittmann, K., Golbik, R., Ghisla, S. & Hubner, G. (2000). Mechanism of elementary catalytic steps of pyruvate oxidase from Lactobacillus plantarum. Biochemistry, 39, 10747-10754. Tittmann, K., Proske, D., Spinka, M., Ghisla, S., Rudolph, R., Hubner, G. & Kern, G. (1998). Activation of thiamine diphosphate and FAD in the phosphatedependent pyruvate oxidase from Lactobacillus plantarum. The Journal of biological chemistry, 273, 12929-12934. Tonjes, M., Barbus, S., Park, Y. J., Wang, W., Schlotter, M., Lindroth, A. M., Pleier, S. V., Bai, A. H., Karra, D., Piro, R. M., Felsberg, J., Addington, A., Lemke, D., Weibrecht, I., Hovestadt, V., Rolli, C. G., Campos, B., Turcan, S., Sturm, D., Witt, H., Chan, T. A., Herold-Mende, C., Kemkemer, R., Konig, R., Schmidt, K., Hull, W. E., Pfister, S. M., Jugold, M., Hutson, S. M., Plass, C., Okun, J. G., Reifenberger, G., Lichter, P. & Radlwimmer, B. (2013). BCAT1 promotes cell proliferation through amino acid catabolism in gliomas carrying wild-type IDH1. Nature medicine, 19, 901-908. Tovar-Mendez, A., Miernyk, J. A. & Randall, D. D. (2003). Regulation of pyruvate dehydrogenase complex activity in plant cells. European journal of biochemistry/FEBS, 270, 1043-1049. Trofimova, L. K., Araujo, W. L., Strokina, A. A., Fernie, A. R., Bettendorff, L. & Bunik, V. I. (2012). Consequences of the alpha-ketoglutarate dehydrogenase inhibition for neuronal metabolism and survival: implications for neurodegenerative diseases. Current medicinal chemistry, 19, 5895-5906. Tsepkova, P., Artiukhov, A., Boyko, A., Aleshin, V., Mkrtchyan, G., Zvyaginstseva, M., Ryabov, S., Ksenofontov, A., Baratova, L., Graf, A. V. & Bunik, V. I. (2017). Thiamine induces long-term changes in amino acid profiles and activities of 2-oxogutarate and 2-oxoadipate dehydrogenases in rat brain. Biochemistry (Mosc), 82, 958-973. Tso, S. C., Gui, W. J., Wu, C. Y., Chuang, J. L., Qi, X., Skvora, K. J., Dork, K., Wallace, A. L., Morlock, L. K., Lee, B. H., Hutson, S. M., Strom, S. C., Williams, N. S., Tambar, U. K., Wynn, R. M. & Chuang, D. T. (2014a). Benzothiophene carboxylate derivatives as novel allosteric inhibitors of branched-chain alpha-ketoacid dehydrogenase kinase. The Journal of biological chemistry, 289, 20583-20593. Tso, S. C., Kato, M., Chuang, J. L. & Chuang, D. T. (2006). Structural determinants for cross-talk between pyruvate dehydrogenase kinase 3 and lipoyl domain 2 of the human pyruvate dehydrogenase complex. The Journal of biological chemistry, 281, 27197-27204. Tso, S. C., Qi, X., Gui, W. J., Chuang, J. L., Morlock, L. K., Wallace, A. L., Ahmed, K., Laxman, S., Campeau, P. M., Lee, B. H., Hutson, S. M., Tu, B. P., Williams, N. S., Tambar, U. K., Wynn, R. M. & Chuang, D. T. (2013). Structure-based design and mechanisms of allosteric inhibitors for mitochondrial branched-chain alpha-ketoacid dehydrogenase kinase. Proceedings of the National Academy of Sciences of the United States of America, 110, 9728-9733. Tso, S. C., Qi, X., Gui, W. J., Wu, C. Y., Chuang, J. L., Wernstedt-Asterholm, I., Morlock, L. K., Owens, K. R., Scherer, P. E., Williams, N. S., Tambar, U. K., Wynn, R. M. & Chuang, D. T. (2014b). Structure-guided development of specific pyruvate dehydrogenase kinase inhibitors targeting the ATP-binding pocket. The Journal of biological chemistry, 289, 4432-4443. Turcan, S., Rohle, D., Goenka, A., Walsh, L. A., Fang, F., Yilmaz, E., Campos, C., Fabius, A. W., Lu, C., Ward, P. S., Thompson, C. B., Kaufman, A., Guryanova, O., Levine, R., Heguy, A., Viale, A., Morris, L. G., Huse, J. T., Mellinghoff, I. K. & Chan, T. A. (2012). IDH1 mutation is sufficient to establish the glioma hypermethylator phenotype. Nature, 483, 479-483. Tylicki, A., Czerniecki, J., Godlewska, A., Kieliszek, M., Zebrowski, T., Bielawski, T. & Wojcik, B. (2008). Changes in ECG and enzyme activity in rat heart after myocardial infarction: effect of TPP and MnCl2. Journal of physiology and biochemistry, 64, 93-101. Ucal, M., Kraitsy, K., Weidinger, A., Paier-Pourani, J., Patz, S., Fink, B., Molcanyi, M. & Schafer, U. (2017). Comprehensive Profiling of Modulation of Nitric Oxide Levels and Mitochondrial Activity in the Injured Brain: An Experimental Study Based on the Fluid Percussion Injury Model in Rats. Journal of neurotrauma, 34, 475-486. Ussher, J. R., Wang, W., Gandhi, M., Keung, W., Samokhvalov, V., Oka, T., Wagg, C. S., Jaswal, J. S., Harris, R. A., Clanachan, A. S., Dyck, J. R. & Lopaschuk, G. D. (2012). Stimulation of glucose oxidation protects against acute myocardial infarction and reperfusion injury. Cardiovascular research, 94, 359-369. Vazquez, A., Kamphorst, J. J., Markert, E. K., Schug, Z. T., Tardito, S. & Gottlieb, E. (2016). Cancer metabolism at a glance. Journal of cell science, 129, 3367-3373. Veena, R. K., Ajith T. A., Janardhanan, K. K. & Antonawich, F. (2016). Antitumor Effects of Palladium-α-Lipoic Acid Complex Formulation as an Adjunct in Radiotherapy. J Environ Pathol Toxicol Oncol, 35, 333-342. Venugopal, A., Bryk, R., Shi, S., Rhee, K., Rath, P., Schnappinger, D., Ehrt, S. & Nathan, C. (2011). Virulence of Mycobacterium tuberculosis depends on lipoamide dehydrogenase, a member of three multienzyme complexes. Cell host & microbe, 9, 21-31. Vienozinskis, J., Butkus, A., Cenas, N. & Kulys, J. (1990). The mechanism of the quinone reductase reaction of pig heart lipoamide dehydrogenase. The Biochemical journal, 269, 101-105. Vijayakrishnan, S., Callow, P., Nutley, M. A., McGow, D. P., Gilbert, D., Kropholler, P., Cooper, A., Byron, O. & Lindsay, J. G. (2011). Variation in the organization and subunit composition of the mammalian pyruvate dehydrogenase complex E2/E3BP core assembly. The Biochemical journal, 437, 565-574. Vijayakrishnan, S., Kelly, S. M., Gilbert, R. J., Callow, P., Bhella, D., Forsyth, T., Lindsay, J. G. & Byron, O. (2010). Solution structure and characterisation of the human pyruvate dehydrogenase complex core assembly. Journal of molecular biology, 399, 71-93. Vogel, O., Hoehn, B. & Henning, U. (1972). Molecular structure of the pyruvate dehydrogenase complex from Escherichia coli K-12. Proceedings of the National Academy of Sciences of the United States of America, 69, 1615-1619. Wagenknecht, T., Grassucci, R., Berkowitz, J. & Forneris, C. (1992). Configuration of interdomain linkers in pyruvate dehydrogenase complex of Escherichia coli as determined by cryoelectron microscopy. Journal of structural biology, 109, 70-77. Wagenknecht, T., Grassucci, R., Radke, G. A. & Roche, T. E. (1991). Cryoelectron microscopy of mammalian pyruvate dehydrogenase complex. The Journal of biological chemistry, 266, 24650-24656. Wagenknecht, T., Grassucci, R. & Schaak, D. (1990). Cryoelectron microscopy of frozen-hydrated alpha-ketoacid dehydrogenase complexes from Escherichia coli. The Journal of biological chemistry, 265, 22402-22408. Wagner, T., Barilone, N., Alzari, P. M. & Bellinzoni, M. (2014). A dual conformation of the post-decarboxylation intermediate is associated with distinct enzyme states in mycobacterial KGD (alpha-ketoglutarate decarboxylase). The Biochemical journal, 457, 425-434. Wagner, T., Bellinzoni, M., Wehenkel, A., O’Hare, H. M. & Alzari, P. M. (2011). Functional plasticity and allosteric regulation of alpha-ketoglutarate decarboxylase in central mycobacterial metabolism. Chemistry & biology, 18, 1011-1020. Walden, H. R., Kirby, J. A., Yeaman, S. J., Gray, J., Jones, D. E. & Palmer, J. M. (2008). Xenobiotic incorporation into pyruvate dehydrogenase complex can occur via the exogenous lipoylation pathway. Hepatology, 48, 1874-1884. Wallis, N. G., Allen, M. D., Broadhurst, R. W., Lessard, I. A. & Perham, R. N. (1996). Recognition of a surface loop of the lipoyl domain underlies substrate channelling in the pyruvate dehydrogenase multienzyme complex. Journal of molecular biology, 263, 463-474. Wang, J., Nemeria, N. S., Chandrasekhar, K., Kumaran, S., Arjunan, P., Reynolds, S., Calero, G., Brukh, R., Kakalis, L., Furey, W. & Jordan, F. (2014). Structure and function of the catalytic domain of the dihydrolipoyl acetyltransferase component in Escherichia coli pyruvate dehydrogenase complex. The Journal of biological chemistry, 289, 15215-15230. Waskiewicz, D. E. & Hammes, G. G. (1984). Elementary steps in the reaction mechanism of the alpha-ketoglutarate dehydrogenase multienzyme complex from Escherichia coli: kinetics of succinylation and desuccinylation. Biochemistry, 23, 3136-3143. Watford, M. (2007). Lowered concentrations of branched-chain amino acids result in impaired growth and neurological problems: insights from a branched-chain alpha-keto acid dehydrogenase complex kinase-deficient mouse model. Nutrition reviews, 65, 167-172. Wawrzynczak, E. J., Perham, R. N. & Roberts, G. C. (1981). Conformational mobility of polypeptide chains in 2-oxo acid dehydrogenase complexes from ox heart revealed by proton NMR spectroscopy. FEBS letters, 131, 151-154. Weitzman, P. D. (1972). Regulation of alpha-ketoglutarate dehydrogenase activity in Acinetobacter. FEBS letters, 22, 323-326. Westphal, A. H., Fabisz-Kijowska, A., Kester, H., Obels, P. P. & de Kok, A. (1995). The interaction between lipoamide dehydrogenase and the peripheral-component-binding domain from the Azotobacter vinelandii pyruvate dehydrogenase complex. European journal of biochemistry / FEBS, 234, 861-870. White, F. G. & Ingraham, L. L. (1962). Mechanism of thiamine action: a model of 2-acylthiamine. Journal of the American Chemical Society, 84, 3109-3111. White, R. H., Bleile, D. M. & Reed, L. J. (1980). Lipoic acid content of dihydrolipoyl transacylases determined by isotope dilution analysis. Biochemical and biophysical research communications, 94, 78-84. Whitehouse, S., Cooper, R. H. & Randle, P. J. (1974). Mechanism of activation of pyruvate dehydrogenase by dichloroacetate and other halogenated carboxylic acids. The Biochemical journal, 141, 761-774. Wiczer, B. M. & Bernlohr, D. A. (2009). A novel role for fatty acid transport protein 1 in the regulation of tricarboxylic acid cycle and mitochondrial function in 3T3-L1 adipocytes. Journal of lipid research, 50, 2502-2513. Wilkinson, K. D. & Williams, C. H. Jr. (1979). Evidence for multiple electronic forms of two-electron-reduced lipoamide dehydrogenase from Escherichia coli. The Journal of biological chemistry, 254, 852-862. Wilkinson, K. D. & Williams, C. H. Jr. (1981). NADH inhibition and NAD activation of Escherichia coli lipoamide dehydrogenase catalyzing the NADH-lipoamide reaction. The Journal of biological chemistry, 256, 2307-2314. Williams, C. H. Jr. (1992). Lipoamide dehydrogenase, Glutathione reductase, Thioredoxin reductase and Mercuric reductase-Family of flavoprotein transhydrogenases. In F. Muller (Eds. ), Chemistry and biochemistry of flavoenzymes, 3, (pp. 121-211). Boca Raton: CRC Press. Williams, C. H., Jr. Allison, N., Russell, G. C., Prongay, A. J., Arscott, L. D., Datta, S., Sahlman, L. & Guest, J. R. (1989). Properties of lipoamide dehydrogenase and thioredoxin reductase from Escherichia coli altered by site-directed mutagenesis. Annals of the New York Academy of Sciences, 573, 55-65. Wu, P., Inskeep, K., Bowker-Kinley, M. M., Popov, K. M. & Harris, R. A. (1999). Mechanism responsible for inactivation of skeletal muscle pyruvate dehydrogenase complex in starvation and diabetes. Diabetes, 48, 1593-1599. Wu, P., Sato, J., Zhao, Y., Jaskiewicz, J., Popov, K. M. & Harris, R. A. (1998). Starvation and diabetes increase the amount of pyruvate dehydrogenase kinase isoenzyme 4 in rat heart. The Biochemical journal, 329, 197-201. Wu, T. L. & Reed, L. J. (1984). Subunit binding in the pyruvate dehydrogenase complex from bovine kidney and heart. Biochemistry, 23, 221-226. Wu, X., Milne, J. L., Borgnia, M. J., Rostapshov, A. V., Subramaniam, S. & Brooks, B. R. (2003). A core-weighted fitting method for docking atomic structures into low-resolution maps: application to cryo-electron microscopy. Journal of structural biology, 141, 63-76. Wynn, R. M., Ho, R., Chuang, J. L. & Chuang, D. T. (2001). Roles of active site and novel K+ ion-binding site residues in human mitochondrial branched-chain alpha-ketoacid decarboxylase/ dehydrogenase. The Journal of biological chemistry, 276, 4168-4174. Wynn, R. M., Kato, M., Machius, M., Chuang, J. L., Li, J., Tomchick, D. R. & Chuang, D. T. (2004). Molecular mechanism for regulation of the human mitochondrial branched-chain alpha-ketoacid dehydrogenase complex by phosphorylation. Structure, 12, 2185-2196. Wynn, R. M., Li, J., Brautigam, C. A., Chuang, J. L. & Chuang, D. T. (2012). Structural and biochemical characterization of human mitochondrial branched-chain alpha-ketoacid dehydrogenase phosphatase. The Journal of biological chemistry, 287, 9178-9192. Xu, W. Y., Gu, M. M., Sun, L. H., Guo, W. T., Zhu, H. B., Ma, J. F., Yuan, W. T., Kuang, Y., Ji, B. J., Wu, X. L., Chen, Y., Zhang, H. X., Sun, F. T., Huang, W., Huang, L., Chen, S. D. & Wang, Z. G. (2012). A nonsense mutation in DHTKD1 causes Charcot-Marie-Tooth disease type 2 in a large Chinese pedigree. American journal of human genetics, 91, 1088-1094. Yan, J., Lawson, J. E. & Reed, L. J. (1996). Role of the regulatory subunit of bovine pyruvate dehydrogenase phosphatase. Proceedings of the National Academy of Sciences of the United States of America, 93, 4953-4956. Yang, D., Gong, X., Yakhnin, A. & Roche, T. E. (1998). Requirements for the adaptor protein role of dihydrolipoyl acetyltransferase in the up-regulated function of the pyruvate dehydrogenase kinase and pyruvate dehydrogenase phosphatase. The Journal of biological chemistry, 273, 14130-14137. Yang, H., Frey, P. A., Hainfeld, J. F. & Wall, J. S. (1986). Pyruvate dehydrogenase complex of Escherichia coli: radial mass analysis of subcomplexes by scanning transmission electron microscopy. Biophysical journal, 49, 56-58. Yang, H. C., Hainfeld, J. F., Wall, J. S. & Frey, P. A. (1985). Quaternary structure of pyruvate dehydrogenase complex from Escherichia coli. The Journal of biological chemistry, 260, 16049-16051. Yang, H. S., Morris, J. I., Wang, Q., Korotchkina, L. G., Kwon, M. & Patel, M. S. (2001). Human dihydrolipoamide dehydrogenase gene transcription is mediated by cAMP-response element-like site and TACGAC direct repeat. The international journal of biochemistry & cell biology, 33, 902-913. Yeaman, S. J., Hutcheson, E. T., Roche, T. E., Pettit, F. H., Brown, J. R., Reed, L. J., Watson, D. C. & Dixon, G. H. (1978). Sites of phosphorylation on pyruvate dehydrogenase from bovine kidney and heart. Biochemistry, 17, 2364-2370. Youn, H. & Kang, S. O. (2000). Enhanced sensitivity of Streptomyces seoulensis to menadione by superfluous lipoamide dehydrogenase. FEBS letters, 472, 57-61. Yu, X., Hiromasa, Y., Tsen, H., Stoops, J. K., Roche, T. E. & Zhou, Z. H. (2008). Structures of the human pyruvate dehydrogenase complex cores: a highly conserved catalytic center with flexible N-terminal domains. Structure, 16, 104-114. Yudkoff, M. (2016). Interactions in the Metabolism of Glutamate and the Branched-Chain Amino Acids and Ketoacids in the CNS. Neurochemical research. Zachar, Z., Marecek, J., Maturo, C., Gupta, S., Stuart, S. D., Howell, K., Schauble, A., Lem, J., Piramzadian, A., Karnik, S., Lee, K., Rodriguez, R., Shorr, R. & Bingham, P. M. (2011). Non-redox-active lipoate derivates disrupt cancer cell mitochondrial metabolism and are potent anticancer agents in vivo. Journal of molecular medicine, 89, 1137-1148. Zhang, F., Masania, J., Anwar, A., Xue, M., Zehnder, D., Kanji, H., Rabbani, N. & Thornalley, P. J. (2016). The uremic toxin oxythiamine causes functional thiamine deficiency in end-stage renal disease by inhibiting transketolase activity. Kidney international, 90, 396-403. Zhao, X., Miller, J. R. & Cronan, J. E. (2005). The reaction of LipB, the octanoyl-[acyl carrier protein]:protein N-octanoyltransferase of lipoic acid synthesis, proceeds through an acyl-enzyme intermediate. Biochemistry, 44, 16737-16746. Zhao, X., Miller, J. R., Jiang, Y., Marletta, M. A. & Cronan, J. E. (2003). Assembly of the covalent linkage between lipoic acid and its cognate enzymes. Chemistry & biology, 10, 1293-1302. Zhao, Y., Hawes, J., Popov, K. M., Jaskiewicz, J., Shimomura, Y., Crabb, D. W. & Harris, R. A. (1994). Site-directed mutagenesis of phosphorylation sites of the branched-chain alpha-ketoacid dehydrogenase complex. The Journal of biological chemistry, 269, 18583-18587. Zhou, J., Damdimopoulos, A. E., Spyrou, G. & Brune, B. (2007). Thioredoxin 1 and thioredoxin 2 have opposed regulatory functions on hypoxia-inducible factor-1alpha. The Journal of biological chemistry, 282, 7482-7490. Zhou, J., Eleni, C., Spyrou, G. & Brune, B. (2008). The mitochondrial thioredoxin system regulates nitric oxide-induced HIF-1alpha protein. Free radical biology & medicine, 44, 91-98. Zhou, M., Lu, G., Gao, C., Wang, Y. & Sun, H. (2012). Tissue-specific and nutrient regulation of the branched-chain alpha-keto acid dehydrogenase phosphatase, protein phosphatase 2Cm (PP2Cm). The Journal of biological chemistry, 287, 23397-23406. Zhou, Z. H., McCarthy, D. B., O’Connor, C. M., Reed, L. J. & Stoops, J. K. (2001). The remarkable structural and functional organization of the eukaryotic pyruvate dehydrogenase complexes. Proceedings of the National Academy of Sciences of the United States of America, 98, 14802-14807. Zhu, P. P. & Peterkofsky, A. (1996). Sequence and organization of genes encoding enzymes involved in pyruvate metabolism in Mycoplasma capricolum. Protein science: a publication of the Protein Society, 5, 1719-1736. Zündorf, G., Kahlert, S., Bunik, V. I. & Reiser, G. (2009). alpha-Ketoglutarate dehydrogenase contributes to production of reactive oxygen species in glutamate-stimulated hippocampal neurons in situ. Neuroscience, 158, 610-616. Audience: Researchers in enzymology, medical and biotechnological fields; students of biochemistry and molecular biology departments.